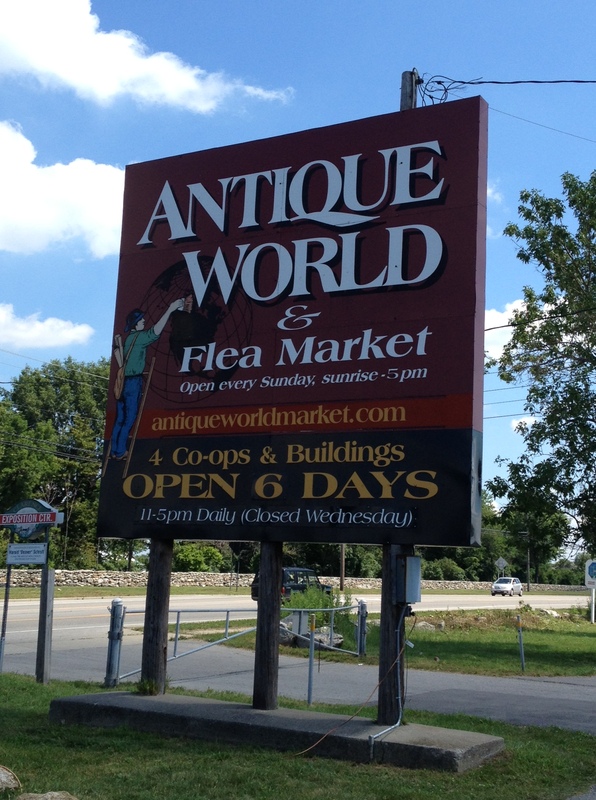 Last month Anson and I visited the Antique World and Flea Market in Clarence, New York. 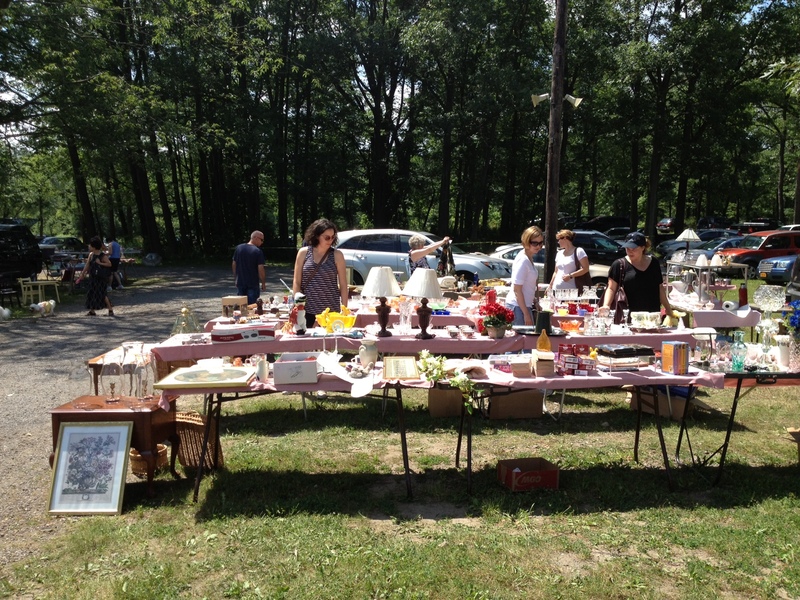 This well established picking destination is composed of multiple group shops, storage unit stalls, and a sprawling flea market every Sunday year round. Clarence is a short drive over the US border (crossing at Niagara Falls), so we figured it would be a great destination on a beautiful summer weekend. The first thing I learned during my visit is to ARRIVE EARLY. We woke up a little late, but we only stopped at the border and for the obligatory road trip Egg McMuffin, and arrived around 11:00am. I felt we made good time but it was obvious we were still late for the flea market. Many of the tables were packing up, and empty spots were evidence that some had already left. I spoke to a dealer who told me that in the summer the action starts at 7am if not before, and that the first few hours are swarmed with buyers. He suggested I arrive no later than 7:30 for a good selection. Fair enough. Any show is the same – early bird gets the worm. It didn’t help matters that this was also shaping up to be one of the hottest days of the year! As it got close to noon it became almost unbearable in the full sun. We found what was left of the flea market pretty uninteresting but there were enough almost promising things that I think you could find some treasures if you came early. I did see a fair selection of toys, housewares, old postcards, jewellery, and collectibles like baseball cards. Nothing really for us, though, so we moved to the adjacent Co-op buildings. The Co-op buildings have storage units along the exterior walls. These rectangular, windowless units are rented as selling spaces or storage. It’s a pretty good idea because sellers don’t have the hassle of packing up when it’s time to leave. The downside is that if it’s a ridiculously hot day you are confined inside a small, airless tomb. Thankfully, within five minutes of looking I saw something – Vernonware in Tam O’Shanter pattern! A whole pile of it! AND it was on sale. 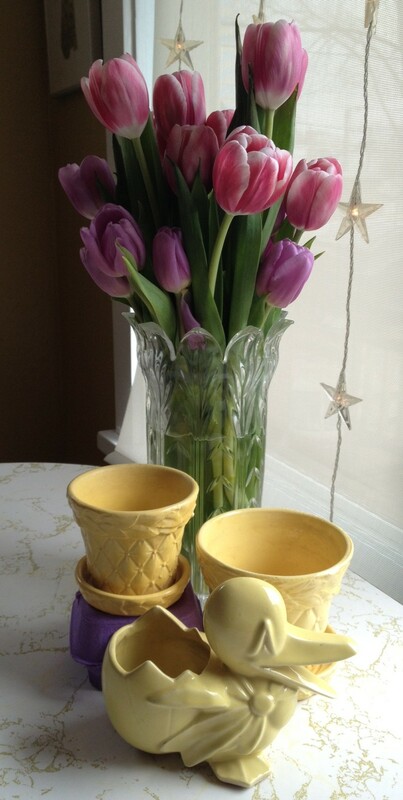 I was able to pick up all the following pieces (with egg cup!) for around $40. 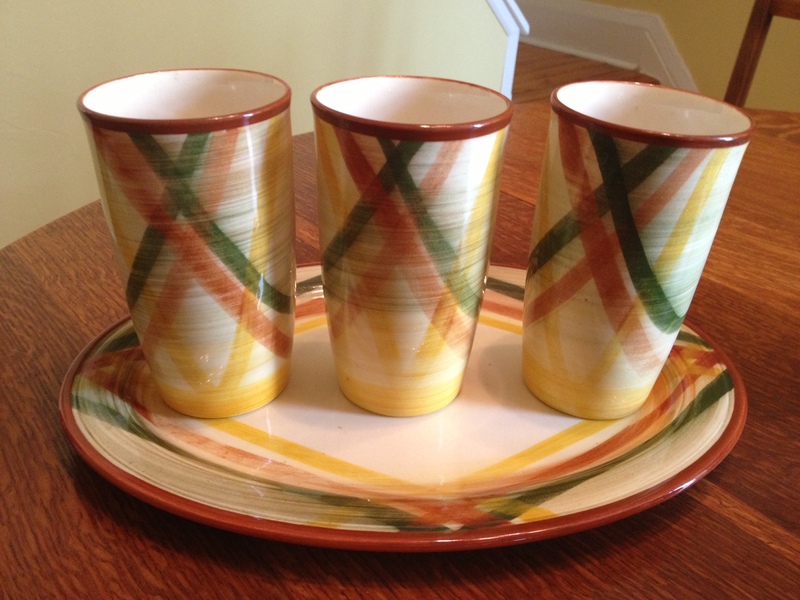 I usually buy my vintage Vernonware online and shipping is a huge extra cost. You can pay, like, $10 for the piece and $25 for shipping to Canada. I felt like the trip was already worth it as I put my first purchase in the car. The few storage booths that were open had a decent assortment of stuff, as long as you weren’t looking for very old antiques. 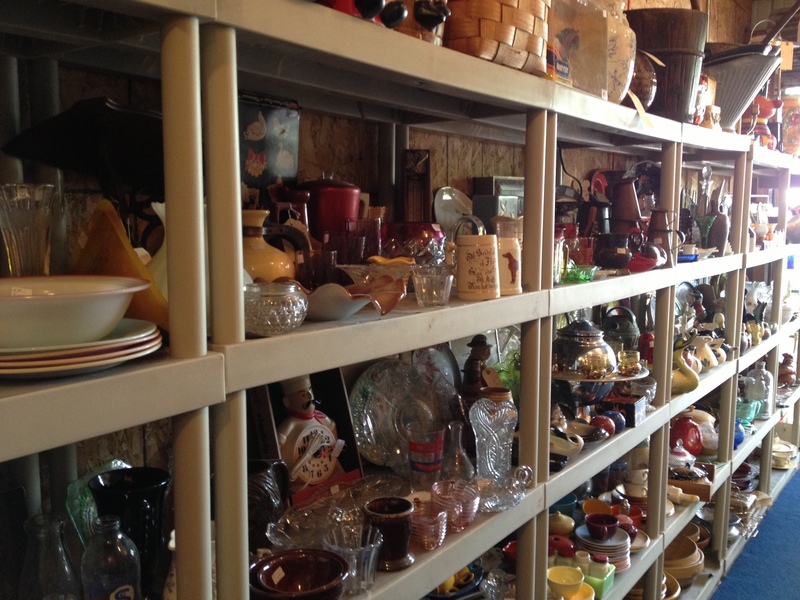 There were a lot of vintage housewares and decorative items. Used books and clothing. A few guys had a “man cave” (the term really fits when it’s a dark tunnel full of neon beer signs). Other booths had new home items like scented candles and tole painted “Bless this Mess” signs. In one booth that had largely automotive items I found a set of 1970s glasses featuring Archie comics characters. I love Archie comics as much as Jughead loves hamburgers so the glasses were the next things to come home with me. It was time to hit the buildings. The buildings at Antique World are probably where you will find the higher end stock, and the quality (and price) varies for each building. The Expo Center is good for vintage and less expensive items. One large area is set up in traditional booths, and the other large area has rows of display cases. This building had lots of items in the $20 – $100 range. 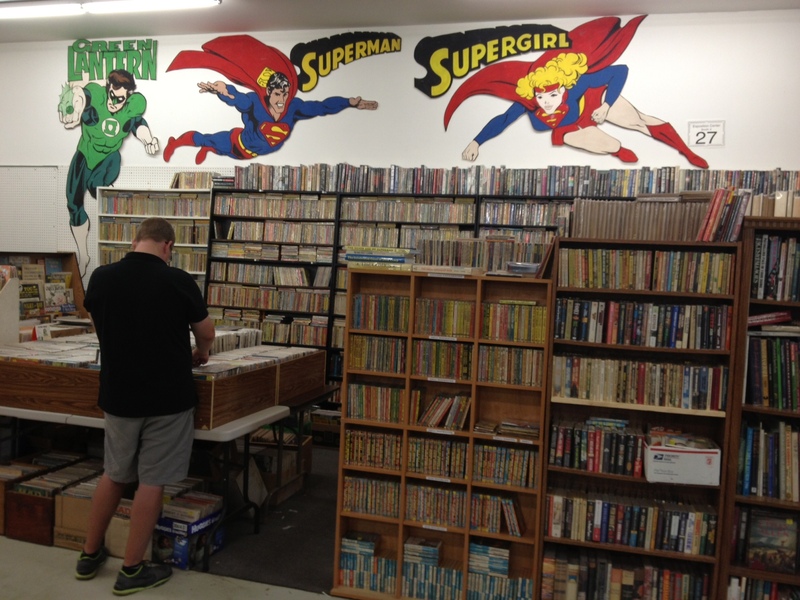 I saw great vintage Sci-fi paperback novels, sports cards, kitchenware, small furniture, and comic books. 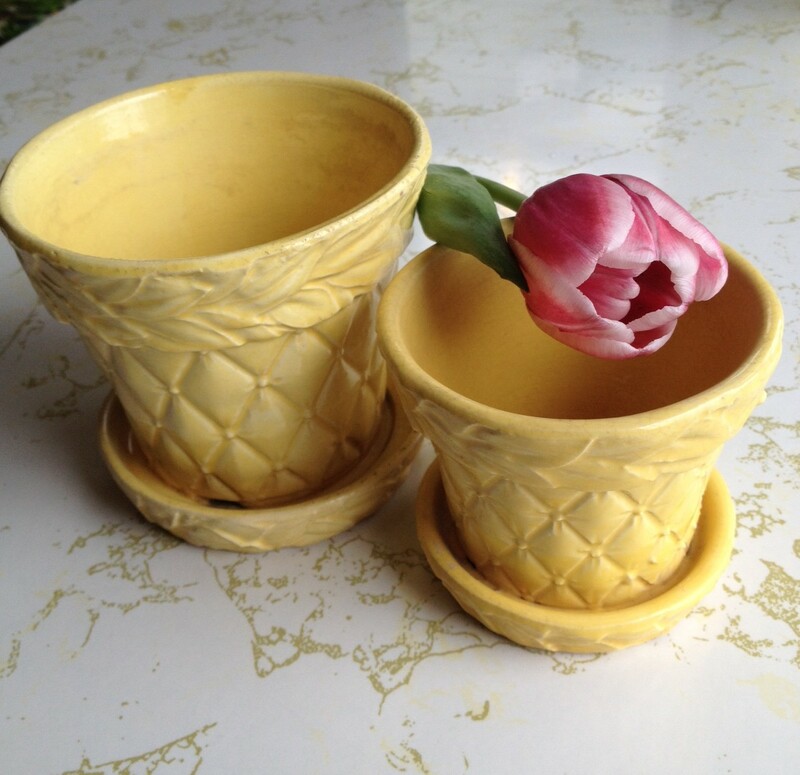 I also finally found a classic McCoy “Arcature” planter with bird, and Vernonware tumblers! 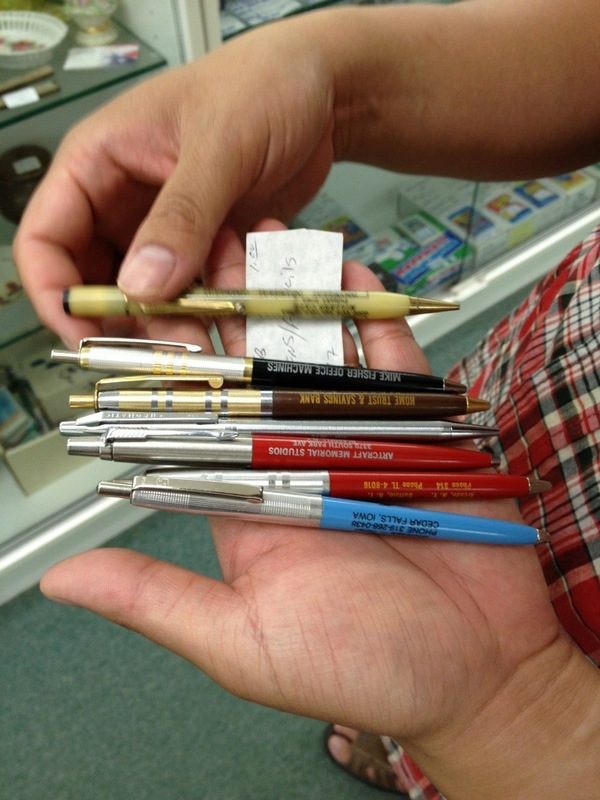 Anson is a big fan of vintage business pens. At $1 each, they were an easy buy! We walked across the giant parking lot to the Indoor Flea Market building next. This building has, as the name implies, a hodge podge of different items. 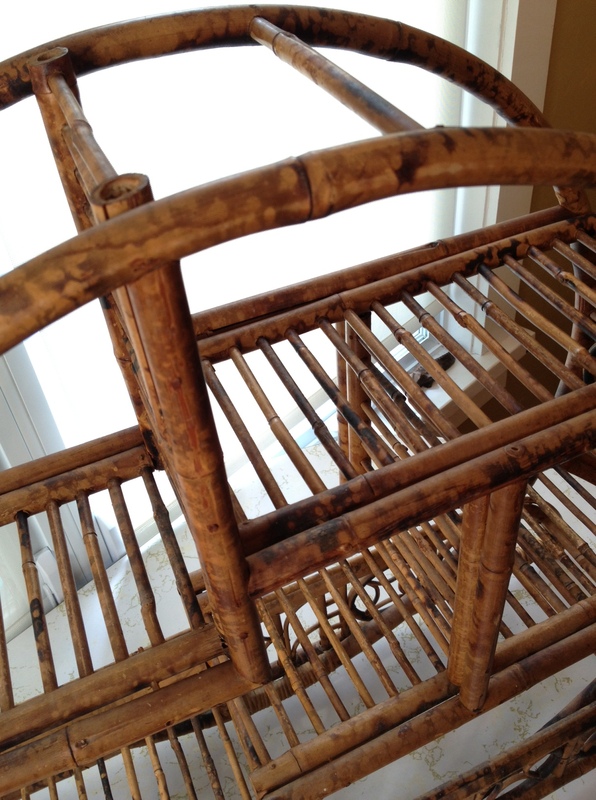 There was furniture in every style from Victorian, to turn of the century farmhouse, to 1980s bamboo. 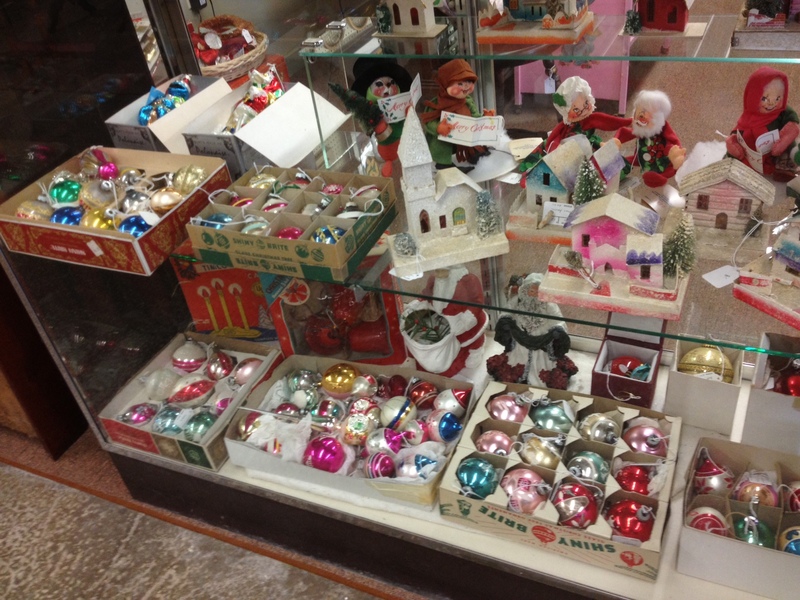 Smalls like textiles, kitchenware, holiday decorations, and toys were common. One dealer had a large selection of records and musical paraphernalia. 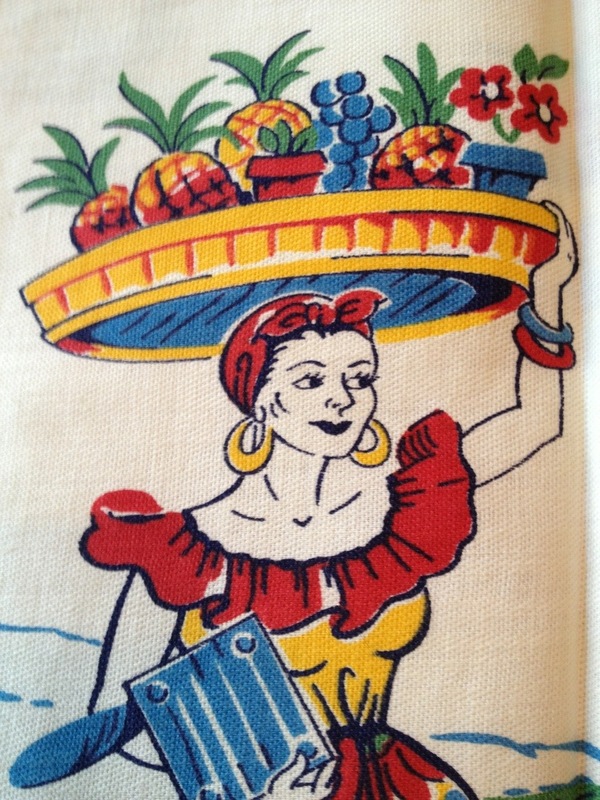 I found a few items, including a vintage tea towel featuring a Caribbean theme with original tags. If there is one thing I love, it’s a tea towel that brings the fiesta to the kitchen. How adorable are these little houses? I was tempted to buy them all. The third building we visited was Uncle Sam’s Antique Co-op. This is a great mid range building with some surprises for the collector. One booth featured the best selection of vintage linens I’ve seen for a long time. 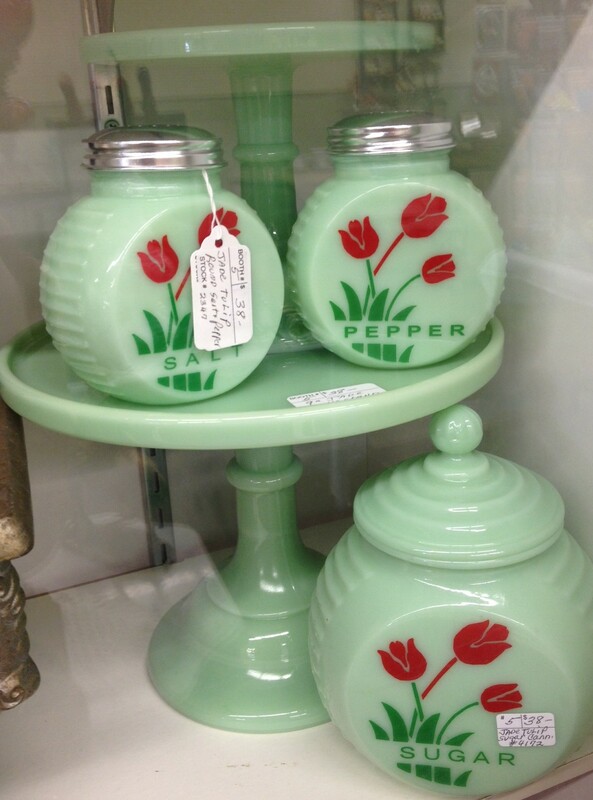 Another had a terrific assortment of 1950s/60s Jadeite kitchenware. 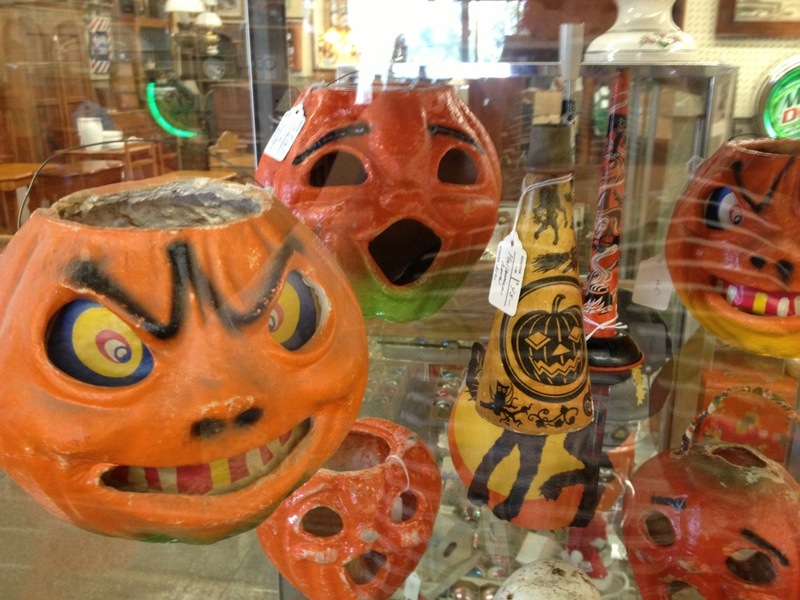 I saw vintage Halloween and Christmas decorations (picked up some Shiny Brites for $2 – $3 each), old Barbie dolls, lamps and even large pieces of furniture. Uncle Sam’s hit the sweet spot for my taste and budget. It felt like the dealers set up here had well-developed stock in their areas. 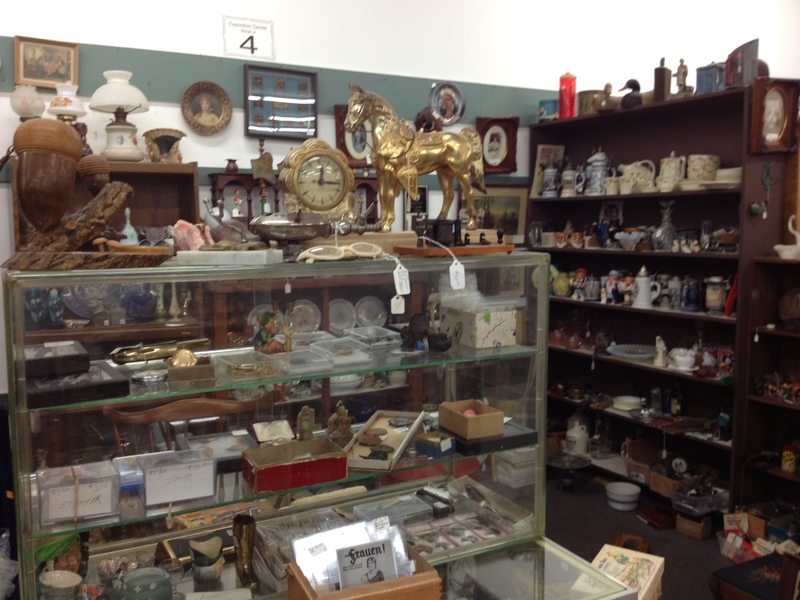 The last buildings we visited were 3 Old Dogs Antiques, and The Premier Antique Center. 3 Dogs had good quality primitive furniture, antique train sets, folk art and some nicely framed artwork and advertising. It is a very nice shop with good antiques. 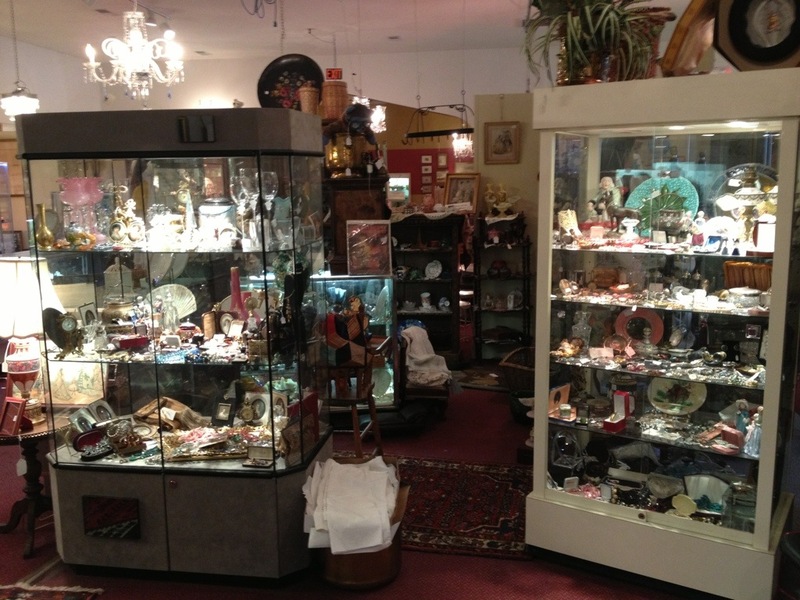 The Premier Antique Center is a group shop that had a likewise high class of antique. This large shop had chandeliers, fine furniture, and display cases with delicate porcelain – everything you think of when you think classic antique shop. It was nice to browse but we didn’t buy anything. Finally, after five hours, it was time to call it a day and go home. There were buildings we didn’t even have time to visit! I will say this for Antique World, it’s big. It seems hard to believe anyone couldn’t find at least something to buy. Between the deals at the flea market, to the mid range booths and high-end shops, there’s something for everyone. If you plan to go, remember to get there early if you want to see the flea market. The flea market operates every Sunday year round, with extra large (and popular) flea markets the 1st Sunday of the month from May to October. The buildings are open every day of the week except Wednesday. 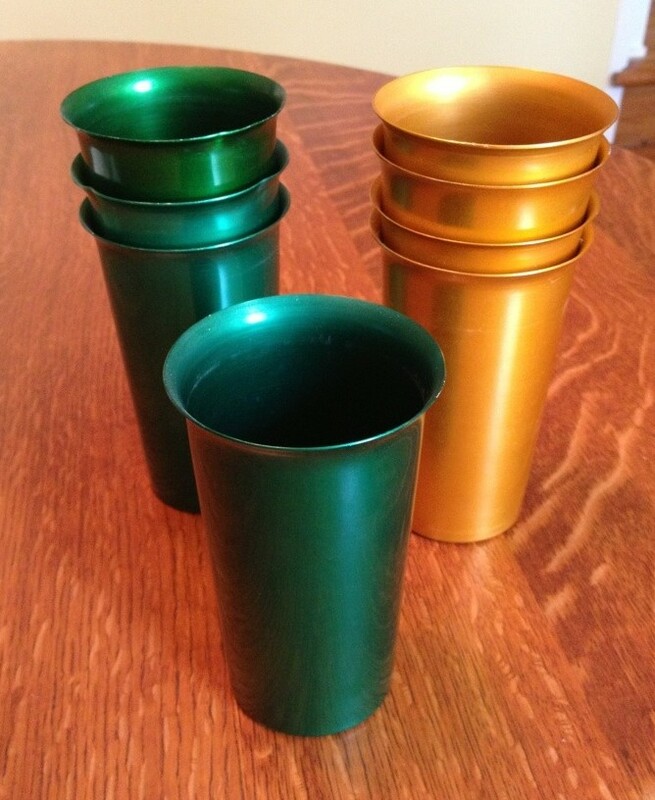 “Royal Sealy” aluminum tumblers in nearly new condition? Yes please! I am a big believer in everyone buying antiques and vintage, but sometimes I forget how intimidating it can be to make a purchase when you’re out of your comfort zone. I have my background growing up in the business, but that doesn’t mean I’m immune to uncertainty and faults in my own judgement. It can be scary so I thought it might help other new collectors if I shared a recent buying story. It turned out great in the end, but I went a little wacky before I found my happy place. 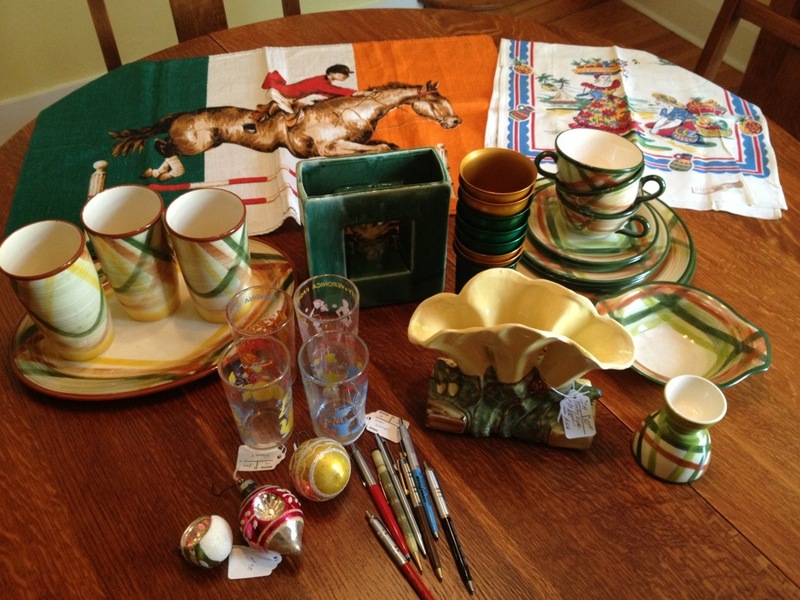 A few weeks ago Anson (my husband) and I went to the Sunday Antique Market in Toronto. It’s a large market with dealers set up inside and out. 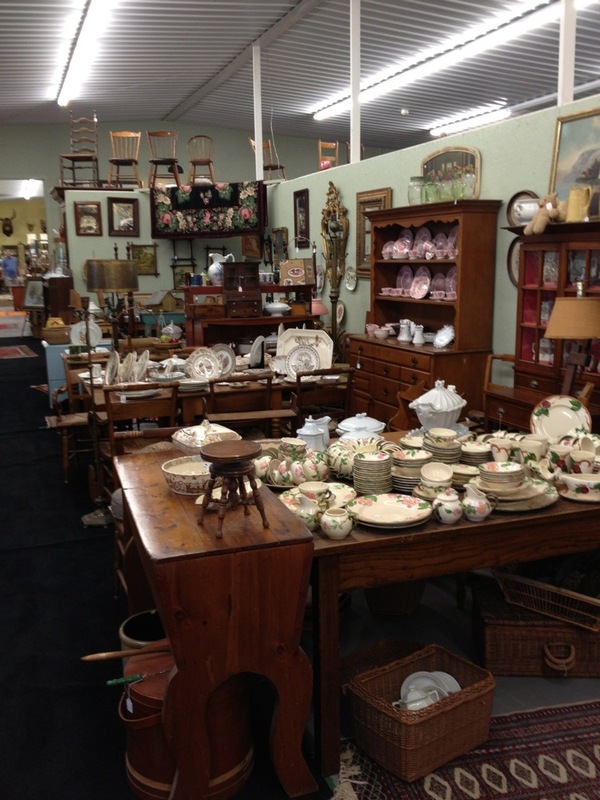 The packed area offers a great assortment of decorative and housewares items, jewelery, collectibles, art and small antique furniture. Anson and I had each happily bought small items and we were getting ready to leave when I spied a round bamboo shelf near the doors. My first reaction was to smile because the shelf looked to me like pure vintage Tiki. Round with asymmetrical platforms, sitting around 3 feet tall and 3 feet wide, it felt like something out of the 1960s or 70s. I could see it gracing a rec room along with a couch in a tropical print and a hifi stereo. This is what happens when you buy old stuff, by the way, your imagination takes over. Removed from a defined setting, antiques become curiosities in themselves, and you fill in the blanks (right or wrong) of the item’s story. Anyway, to my surprise Anson was not opposed to checking out the shelf in more detail. So we went up and took a closer look. The price was $125. Hmm. Not an easy bit of cash to drop on something I wasn’t sure about. A man approached us and began to tell us about the piece. He told us the shelf was not from the mid 20th century, but much earlier. He though it was Victorian (late 1800s) and he made reference to the burnt finish as proof. He said the shelf was all notched construction without the use of nails. Finally, he lowered the price to $110. 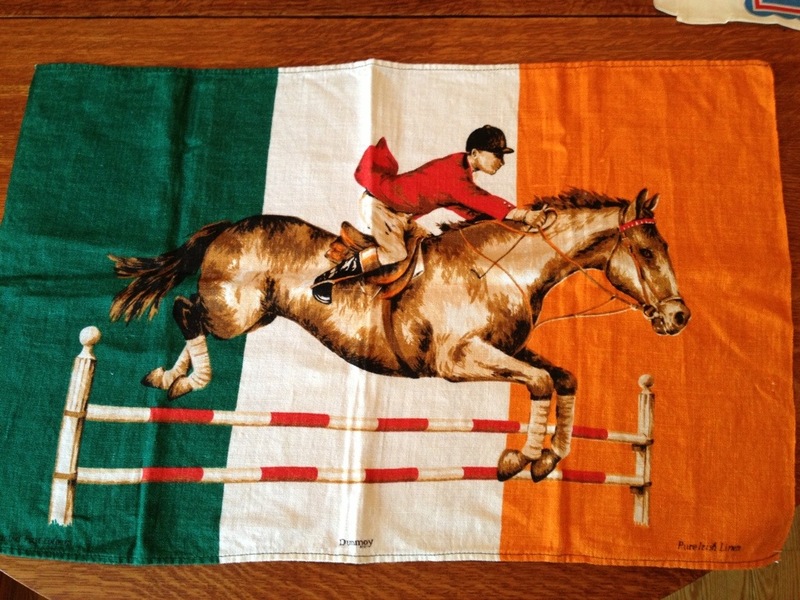 Now, all of a sudden, it was exciting to think we could own this marvelous piece. Victorian bamboo! Isn’t that really collectible? The rush of emotion was saying “I must have this” and it felt good. Looking at Anson, I could see he felt the same way. We paid the man, shook his hand, and carried the shelf to our car. In the ten minutes it took to carry the shelf to the car I experienced my first taste of bitter suspicion. 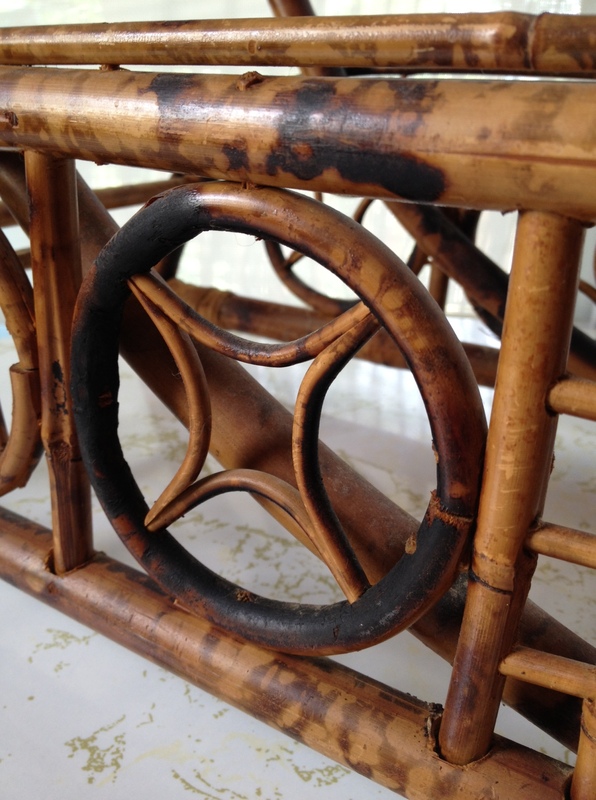 The shelf was solid, yes, but some of the bamboo was cracked. Why hadn’t I seen that? There were not nails but large screws helping hold the bottom construction together. And what about the style? I knew this looked a lot more 1960s than Victorian. Or did I know that? My mood crashed as I tried to reconcile what I was now suspecting with what I had believed only moments earlier. Was it even old? I did a Google search on my phone and found a warning about fake and newly made bamboo being sold as Victorian. Even thinking of that pun could not lift my spirits! The money wasn’t even the point – my pride was hurt. I was certain the man who sold me the shelf thought he was telling us the truth. But was it the truth? The whole ride home I was voicing my concerns and bouncing between opinions. I decided the shelf was not new – it was too well made and the finish looked old. But questions remained. After much comforting Anson finally asked “do you still like it?”. Yes, I answered. “Then it’s worth it!” he said. Anson had a clarity I lacked. Yes, I did like it. Yes, I liked it even if it wasn’t Victorian. Yes. Okay. When I got home I took a few photos and phoned my parents for some quick feedback. They liked the shelf although it was not really to their taste. 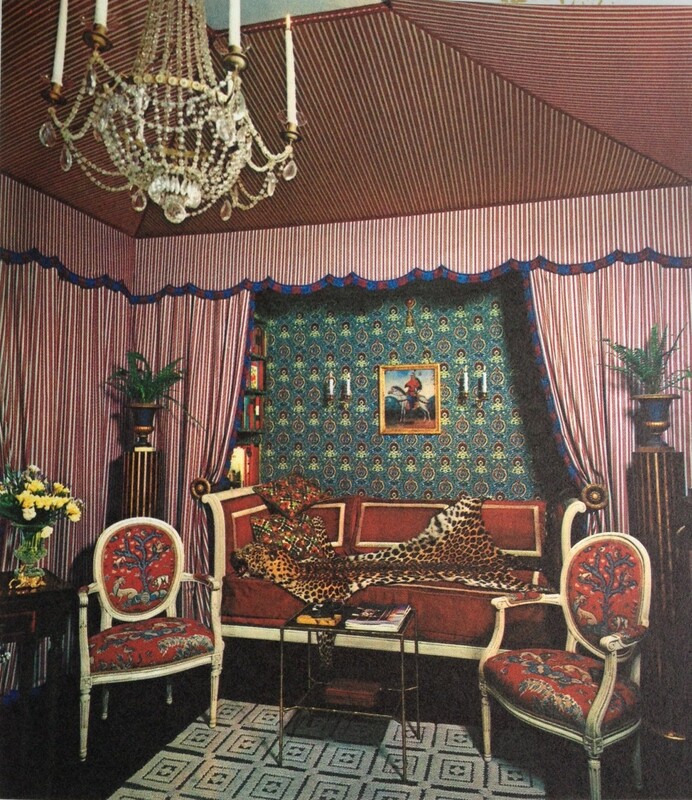 They thought it probably wasn’t Victorian but maybe from the 1940s to coincide with that time’s heightened interest in “Oriental” design. I confirmed it was solid and not missing any pieces that I could see. Finally we agreed it was just my style and really, what can you buy nowadays with $100? They thought it was a good buy, Anson thought it was a good buy, and now I did too. I put the shelf on an antique cupboard in our dining room and put some of my McCoy pottery on it. I had bought the piece specifically to display the pottery and I was happy to see it suited my vintage planters nicely. So in the space of a few hours the saga of the bamboo shelf had finally come to an end. In that time I had gone from the rush of love at first sight, to the lows of suspicion and fear, and then back up to contentment. Kind of a crazy amount of emotion for a shopping trip, but also probably normal for a less experienced buyer like me. 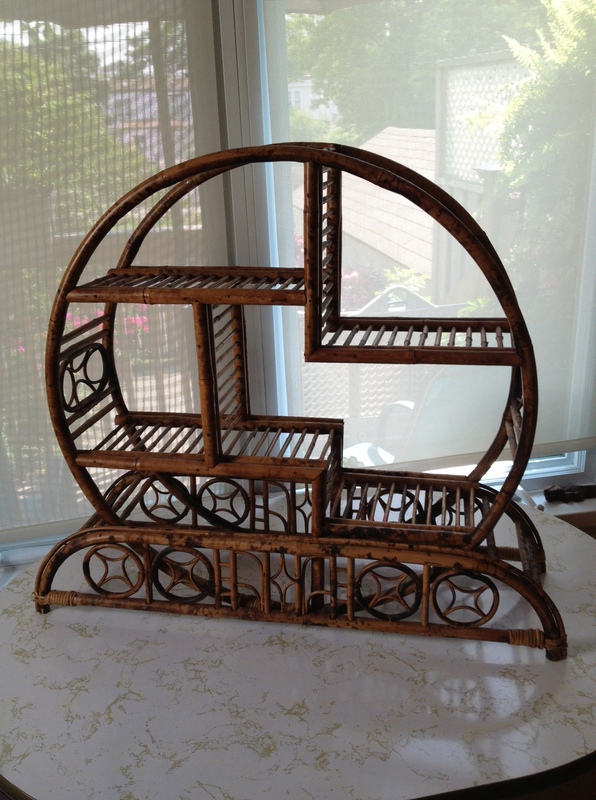 I still don’t know for sure when the shelf was made, but that’s sometimes the reality of buying antiques. I know it’s well made, and most importantly I know I like it. Every buyer has to take a leap of faith sometimes (no one – buyer or seller – can be an expert on everything), but if you buy what you love you will not regret it. 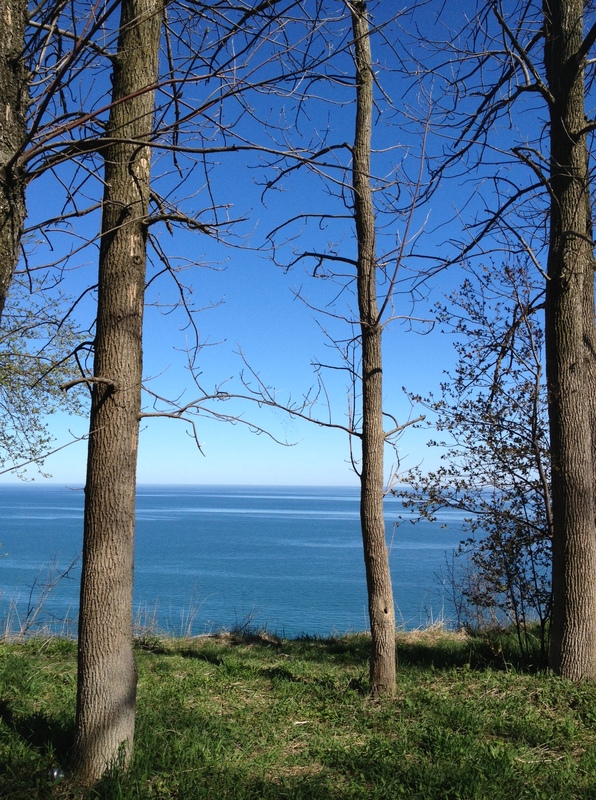 Back about a month ago, my husband and I decided to take a drive into nearby southern Scarborough, Ontario. En route to the car, we ran into our neighbour who was born and raised in the area. She recommended we visit “The Guild“. I hadn’t heard of the place but our neighbour said it was a historic parcel of land on the coast of the lake. She said it had a large garden full of antique architectural features, which I was immediately curious about as a sucker for all things garden and architectural. She also said it had once been home to an expansive artist colony (in fact the first artist colony in Canada! ), and still housed a large Inn. It all sounded very interesting, so off we went to visit the Guild. I am so glad we ran into our neighbour that day! The first thing we noticed when we arrived (it’s free to enter and park) was a large building, boarded up and behind a chain link fence. This was the actual Inn – a structure built in 1914 that has been used as a residence, military hospital, shelter and hotel over the years. Obviously neglect has not been kind to this once stately home. It is in a sad state, and thus it was quite easy to imagine why the Inn has a reputation for being haunted. Our disappointment from the Inn, however, was quickly forgotten when we ventured further into the large park behind the building. We were immediately welcomed by towering columns and neatly kept trails through mature trees. The grounds in stark comparison to the Inn are well maintained. The large lawn ends in a tree line, and beyond a beautiful vantage point on top of the bluffs to the lake below. The huge 88 acre grounds are composed of forested areas, large lawns, flower beds, and a few remaining smaller buildings. The most notable building (other than the Inn) is a small log cabin in the woods. 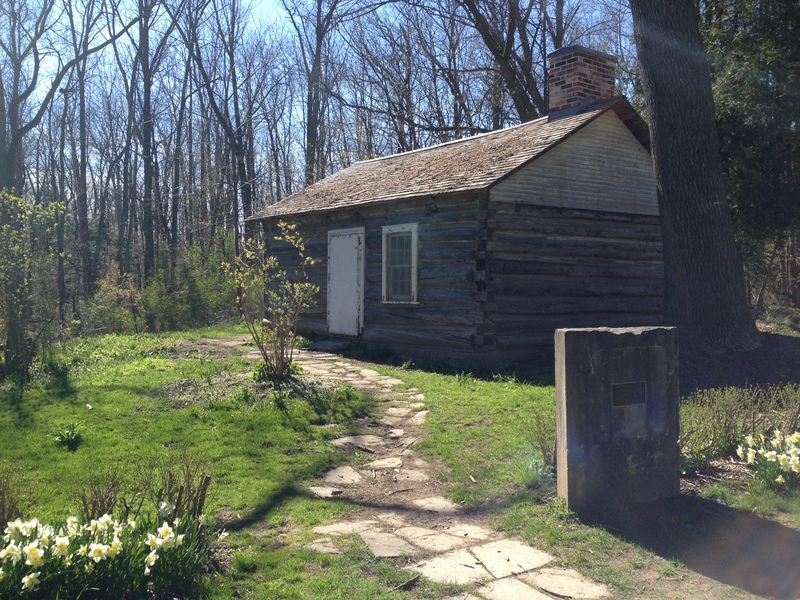 This is the Osterhout cabin which was built in 1795 and is the oldest building in Scarborough. Scattered around, grouped but never very crowded, are architectural remnants of Toronto’s past. 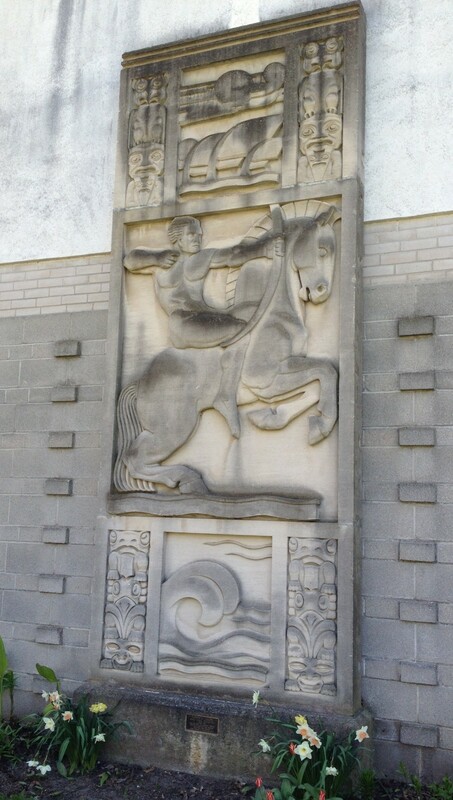 Beautiful archways, columns, and sculpture that once graced the city’s buildings are on display. Plaques give the history of the objects, although some of these have been lost over the years. 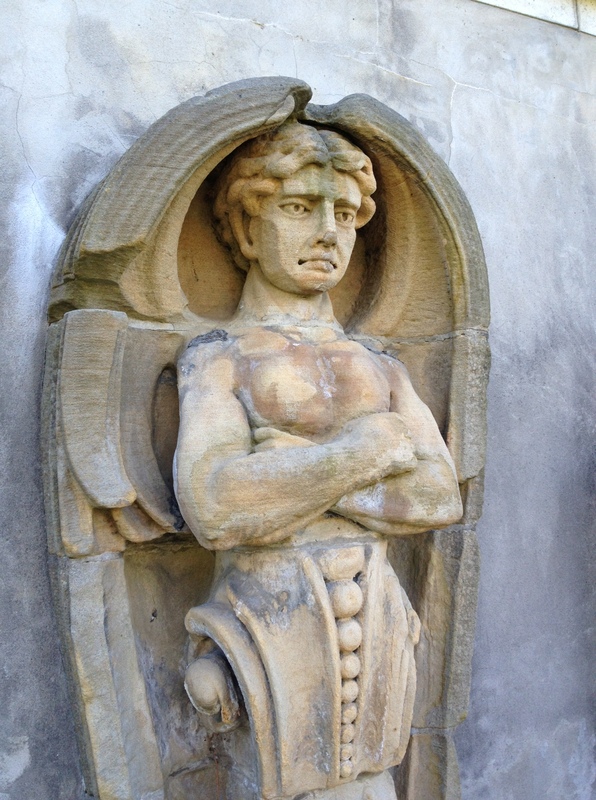 You can enjoy the objects from afar or venture closer – often to discover a face carved into the facade. The day we went there were quite a few people around (it’s a popular spot for wedding photography) but it was easy to feel like you were alone in some historical wonderland. The history of the Guild is very interesting. 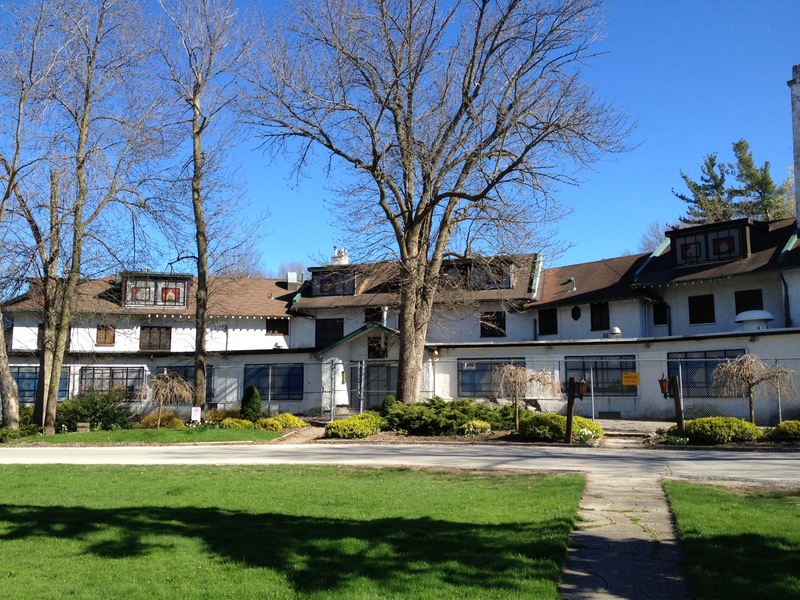 The original manor residence was built in 1914 in the Arts and Crafts style. In 1932 the residence and grounds were bought by Rosa and Spencer Clark. 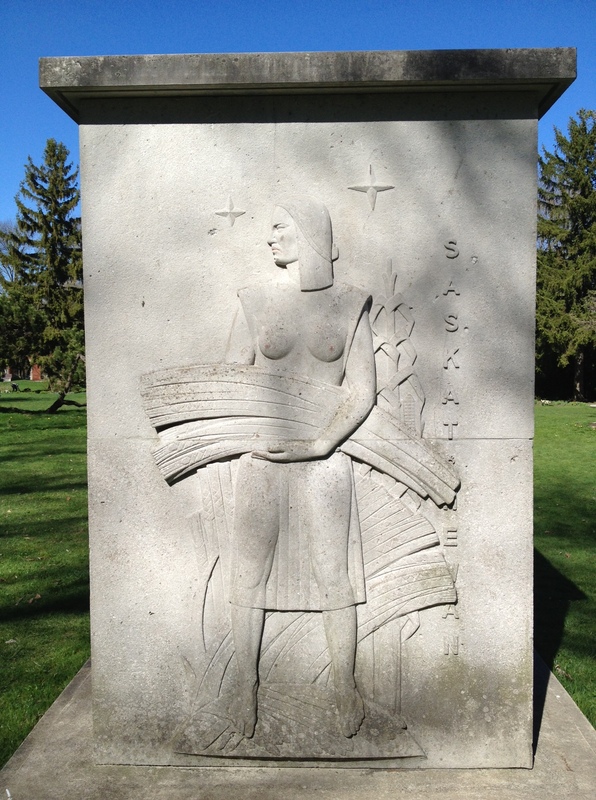 They were great lovers of the arts, and slowly transformed the grounds into an art colony during the Depression era. 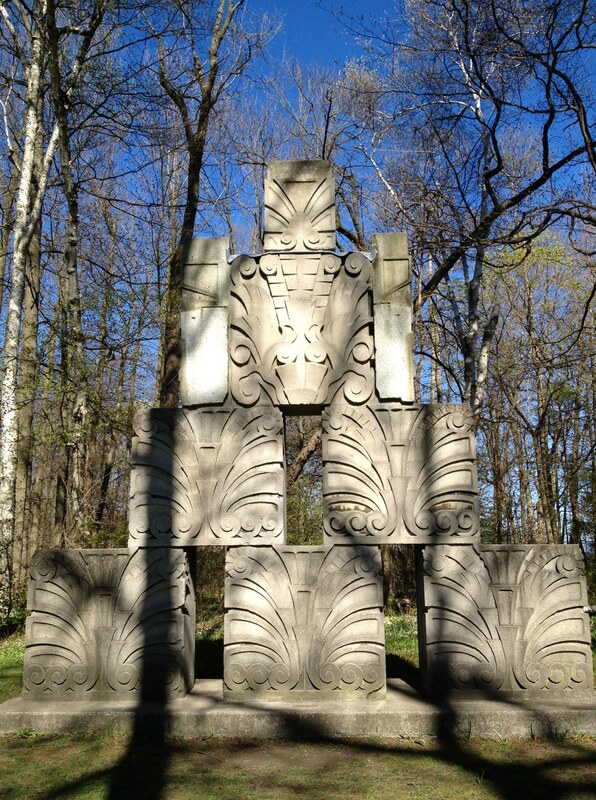 The Clarks rescued facades and ruins of various demolished downtown Toronto buildings to create the Sculpture Park. 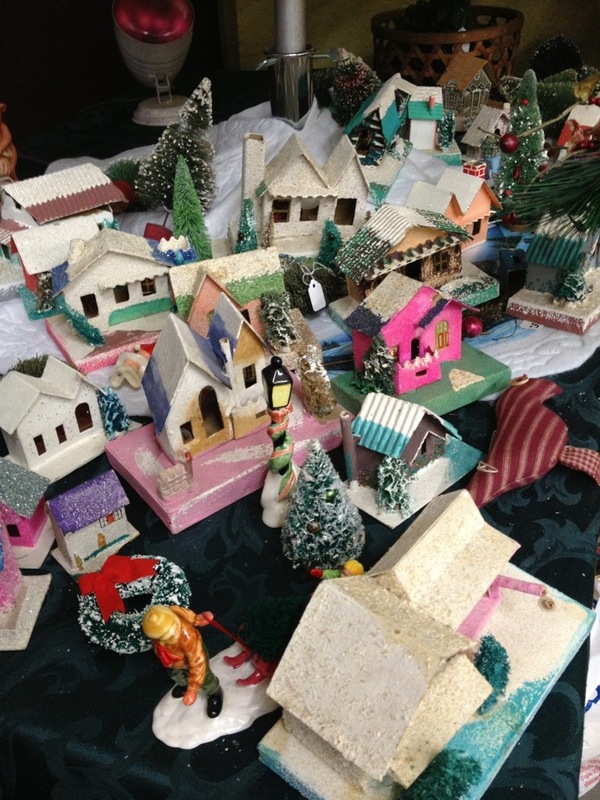 Altogether, pieces of more than 60 structures were amassed. 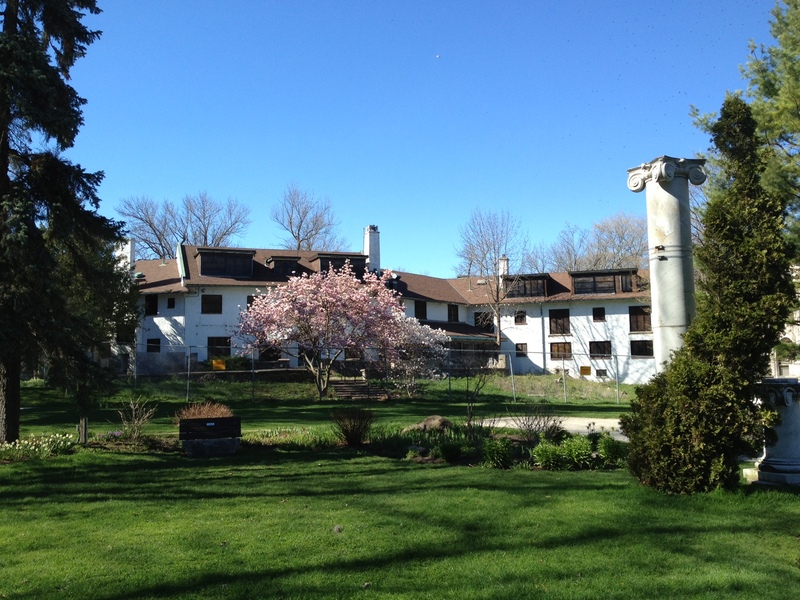 The Guild Inn proved so popular as a lakeside resort and artisans’ community that in 1965 a 100 room addition and a swimming pool were added (I believe this addition was demolished in 2009). 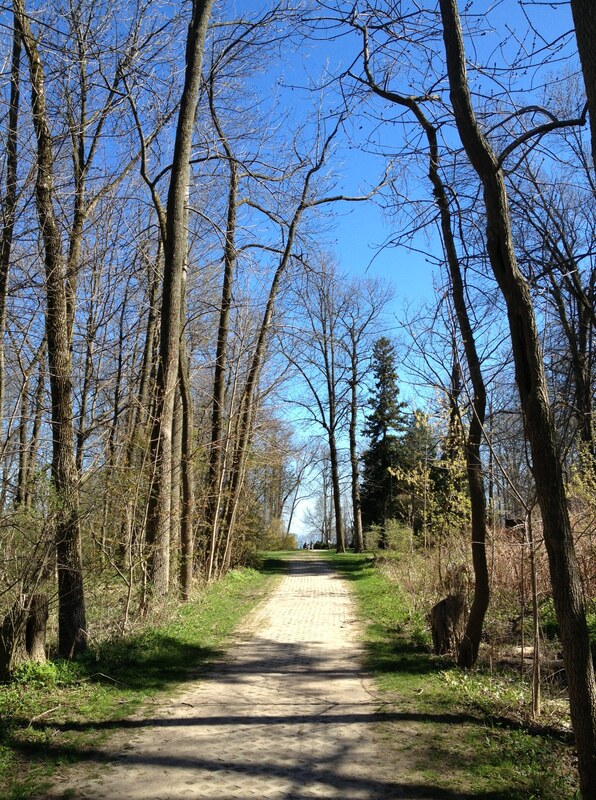 Many people who grew up in this area of Toronto have fond memories of staying at the Inn, or visiting the restaurant for a family meal and walk through the park. The Guild is a unique and memorable historical site that unfortunately continues to languish without proper restoration. Now owned by the city, various plans including a college campus have been proposed to revitalize the land. Personally, I think any plan that can restore the Inn and the art colony would be ideal. There are so many people interested in crafting and the arts it seems like a missed opportunity not to build on what is already part of the land’s cultural background. I could easily see people taking everything from painting lessons on the grounds to metalwork classes in the studios. Most importantly, without some serious money and invested owners, the beautiful objects and buildings already on the land will continue to deteriorate. 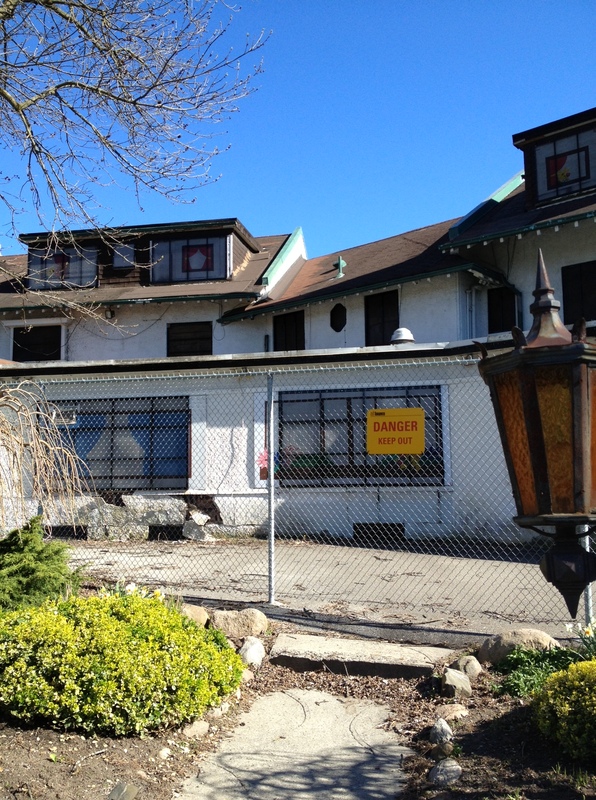 Fortunately, the Guild Inn and surrounding park may still have a bright future. Many local people are active in preserving the space and organizing events that use the park and raise awareness. 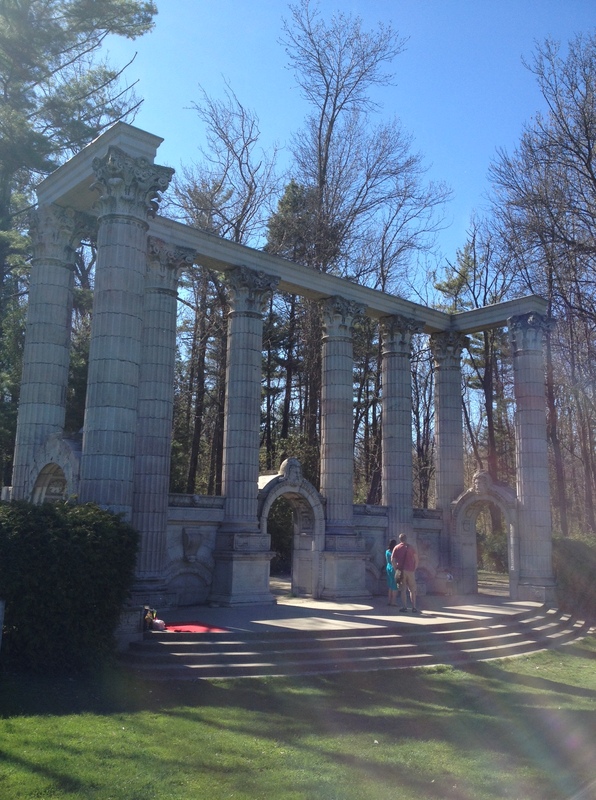 Just this month, CBC radio did an interview with Friends of Guild Park president, John Mason. I recommend a listen (it’s short and well done). There is also a Facebook Page devoted to The Guild, with regularly updated news. If you live in Toronto, you owe it to yourself to visit. Perhaps, like so many artists before, it will inspire you to capture its beauty either through photographs or drawings. Even if you just walk through the park and enjoy the scenery, it will almost definitely inspire you to return. 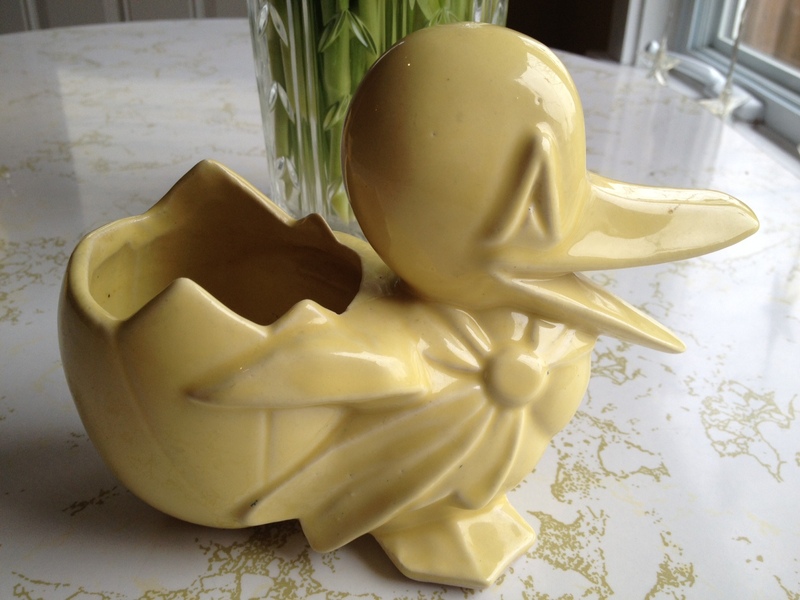 I originally intended to write this post with an Easter theme, and I think this adorable duck would have fit the bill perfectly (Oh that’s right. Pun intended). He’s not a bunny, but this duck’s baby animal quality, mixed with the egg and jaunty “Sunday best” ribbon just seem Easter themed to me. 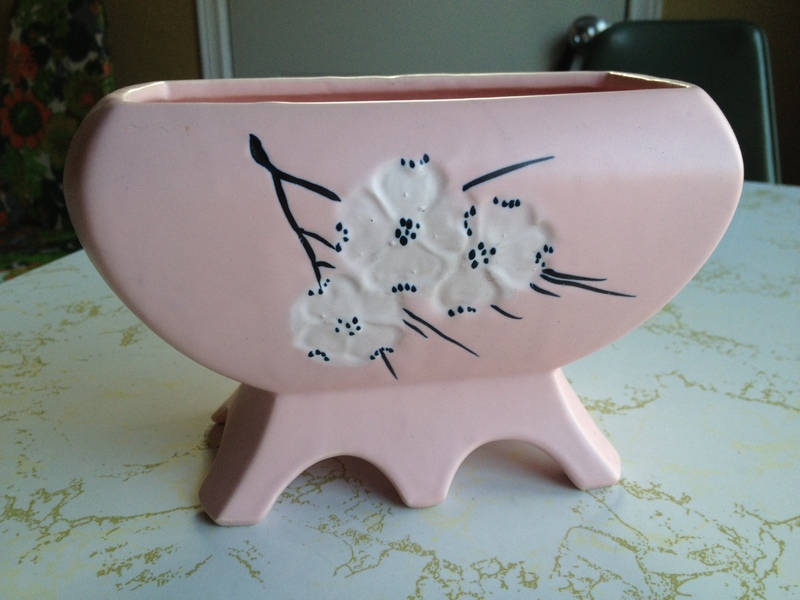 This planter was produced by McCoy in many colours over the 1940s. Many of the varieties had painted details on the face and ribbon, but I think my version was always just in one solid paint. 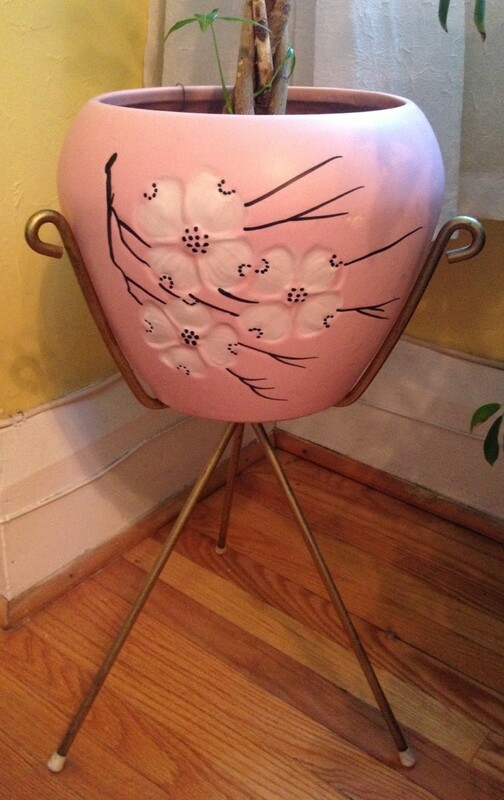 It’s a charming little piece (around 7″ long) and still easily found in the $10 – $25 dollar range depending on condition. 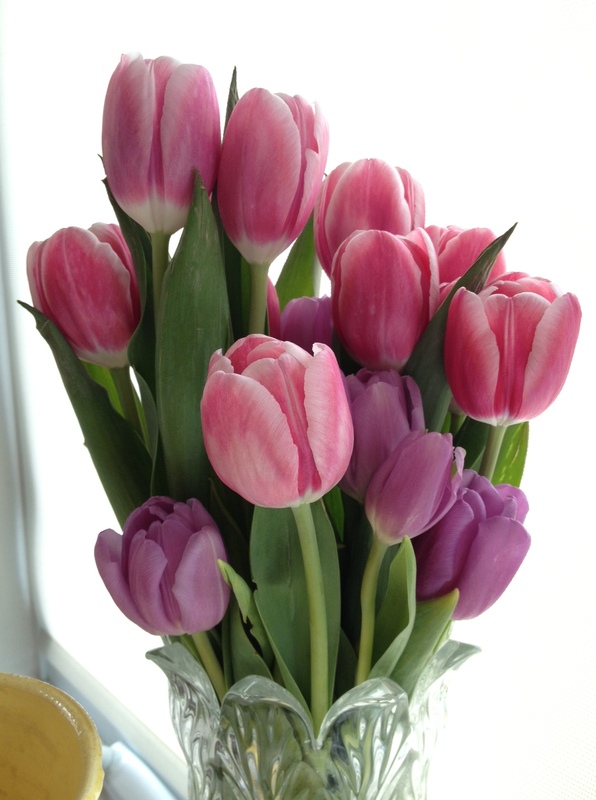 These beauties are classic planters in what is often referred to as the “tufted” or “quilt” pattern. They are from the 1940s / 1950s. I love these planters not only because they are attractive, but because they have attached bottoms for easy use (I promise I’ll put plants in them one day). One is two thirds the size of the other and I really like how the different sizes display as well. Pretty. If you live in a place where Spring exists I envy you. For now I will just have to enjoy my sunny yellow planters and pretend. If you’re looking for more general information regarding McCoy Pottery, check out my earlier posts and another resource I found at VintageMcCoyPottery.com. There are so many types of McCoy pottery planters, and at so many prices, that they really are a fantastic way to bring vintage cheer into any home. This winter has been a long one in my neck of the woods. In an effort to use my free time for things other than watching TV in sweatpants, I’ve completed some good indoor home improvement projects. First, my amazing dad helped me paint the living room and hallway. We went with a lovely greyish green by Benjamin Moore – HC116 Guilford Green. Then, in an effort to decorate the newly painted walls and add usefulness to the space, we built some nice coat hooks. Coat hooks you say? Yes, coat hooks! I spent some time googling coat hooks in the days before we painted (truly, this is why the internet was invented). I wanted something vintage or antique – something unique. 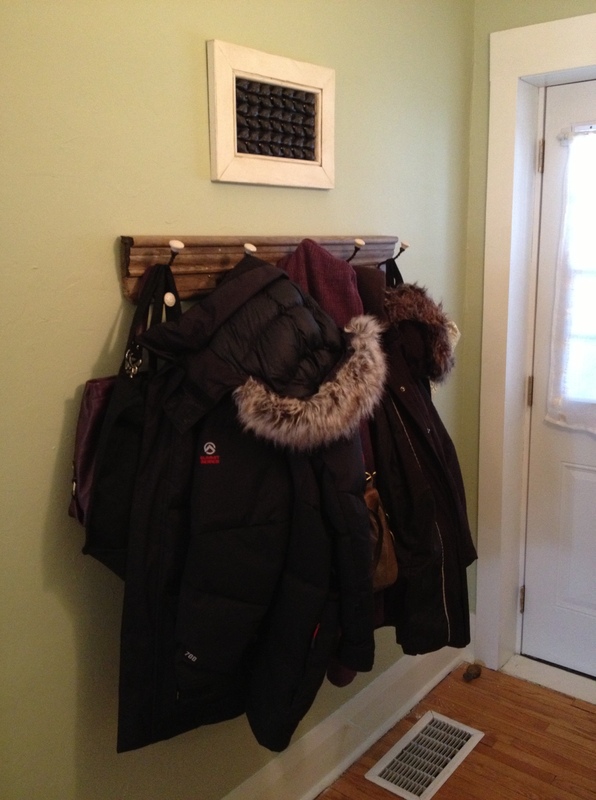 Antique coat racks were often too large or expensive. The solution? 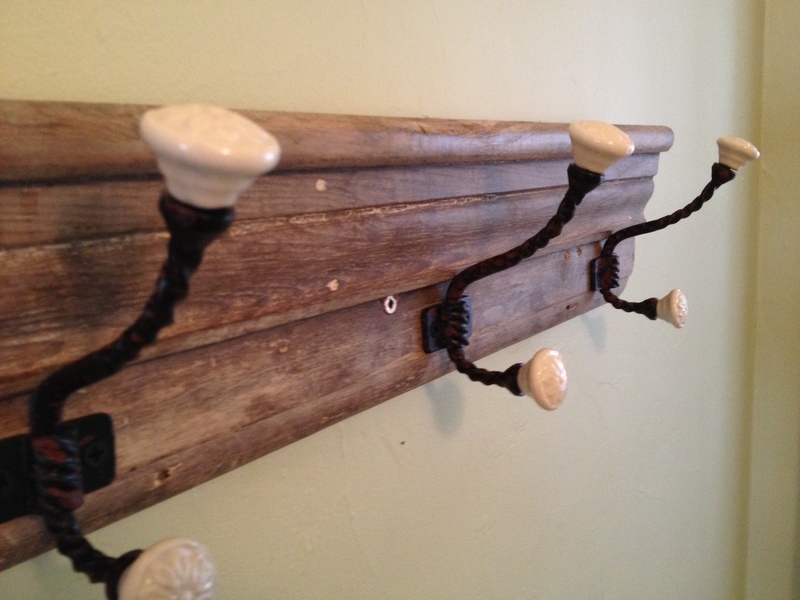 Make our own with salvaged wood! The piece of wood we used is roughly 100-year-old moulding – the type of trim that might have originally been found around a door frame. My dad sometimes comes across architectural details that he keeps to be repurposed when the need arises (for instance as garden decoration). Dad came to our house with a few choices, and we went with this one because of its greyish patina and graceful lines. Old wood can be found anywhere from sources on the internet (try googling “reclaimed wood”), to curb side garbage, thrift stores, lumber yards, and even Habitat for Humanity’s Restores. We cut the wood to size, then waxed it with regular Minwax paste finishing wax. Once we had our piece of wood we had to find the perfect hooks. We needed strong, double hooks capable of holding up parkas. We found them at Anthropologie. Anthropologie is like Zooey Deschanel’s version of Restoration Hardware, if that makes any sense. 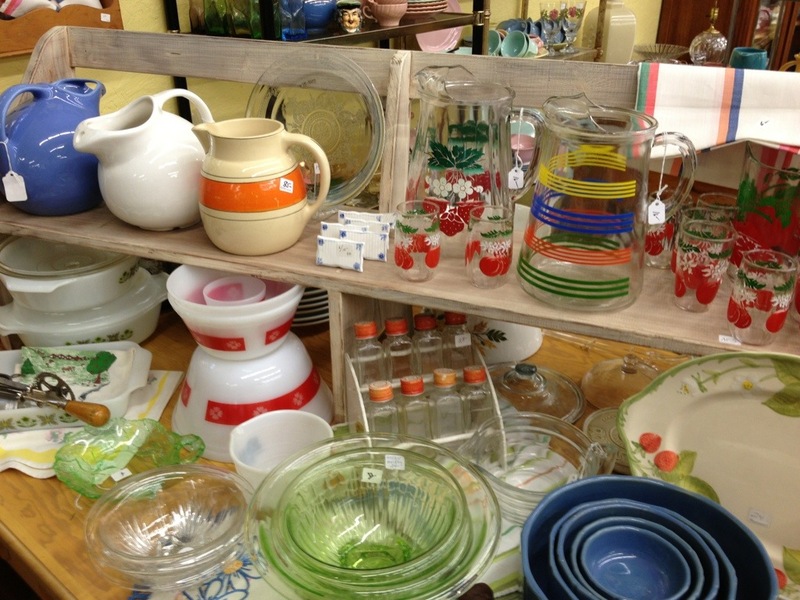 It’s pricey, but you can find lovely unusual and vintage styled items. They have a great selection of knobs, hooks and door knockers. These hooks cost $12 each and I really liked their porcelain tops and slightly distressed metal. Once the wood and hooks were found, it was a simple matter of putting it all together. We measured the hook placement, screwed the hooks into the wood (we used drywall screws because they were the only black screws we could find), and then screwed the wood into studs in our wall. Ta da! A super simple project with beautiful results. 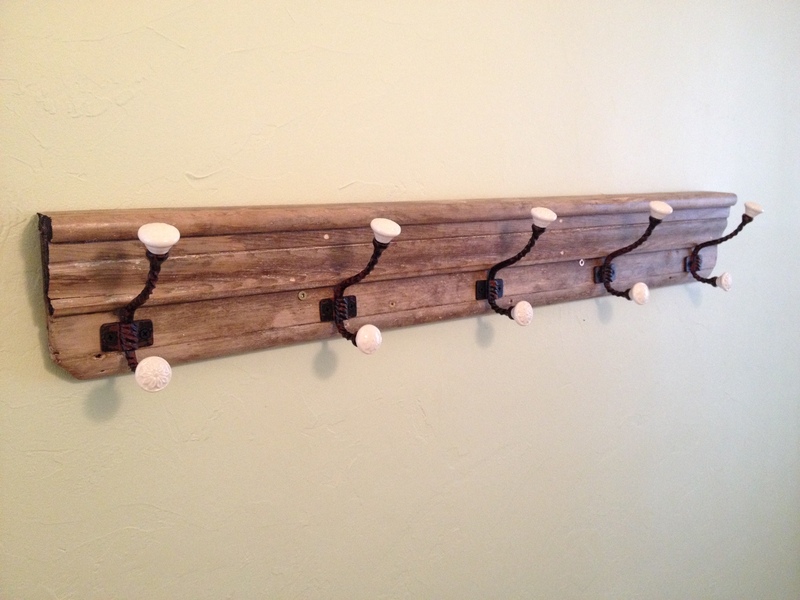 If you are looking to add style to your coat hooks, I highly recommend repurposing some antique wood. If you’re going for a rustic look this could include trim, barn boards, even drift wood. Reclaimed doors or window frames can be really nice too. Be creative – your hooks can match or be completely different for an eclectic style. The two most important considerations will be strength of the wood and strength of the hooks. Really old wood might be too brittle to secure your screws, and really thin wood will not support much weight. Take a careful look at the piece of wood and figure out what shape of hooks you will need and where you can place them. Our hooks, for instance, had to be horizontally secured to the wood and needed enough space to clear the shape of the ledge on top. 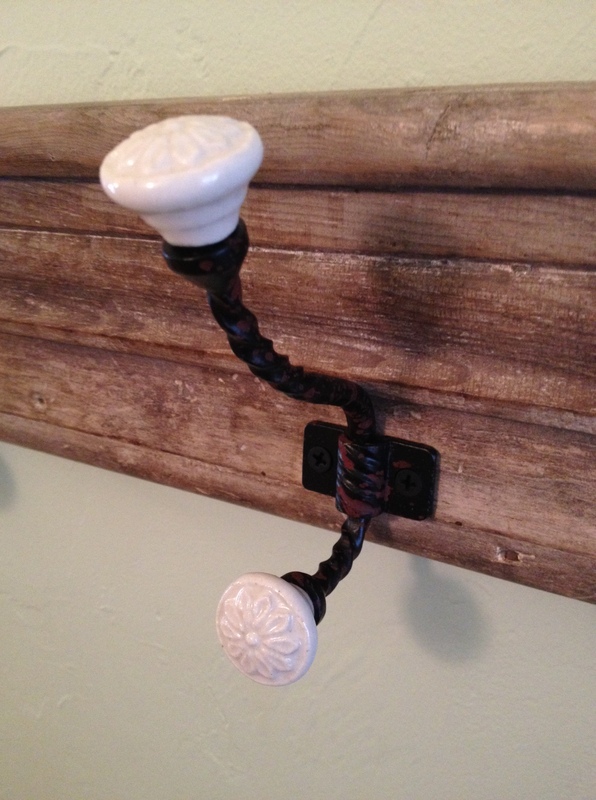 In the end, it’s not rocket science but it can be very rewarding to give the humble coat hook an upgrade with reclaimed lumber. You will be recycling a piece of wood (and maybe hooks), giving your home character, and making something unique. All that and it keeps your coats off the floor?! Winner all around. Yesterday I visited a favorite nearby thrift store. Past trips have yielded a lovely French vintage tea towel and a nice green McCoy pottery planter. 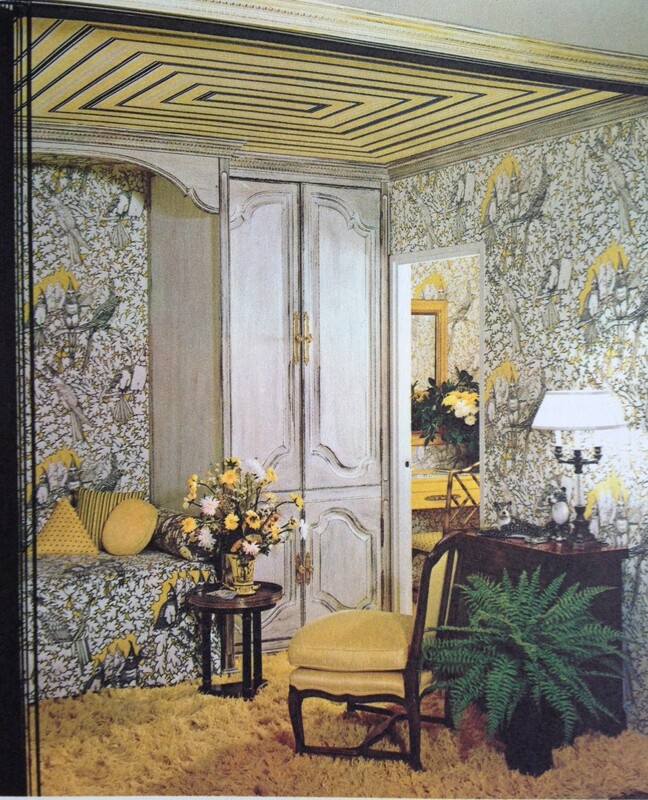 This time my eye spied a decorating book with a tattered but intriguing cover. For a laugh I picked it up. After one minute of flipping pages I went from “this is a crazy thing” to “I MUST OWN THIS”. 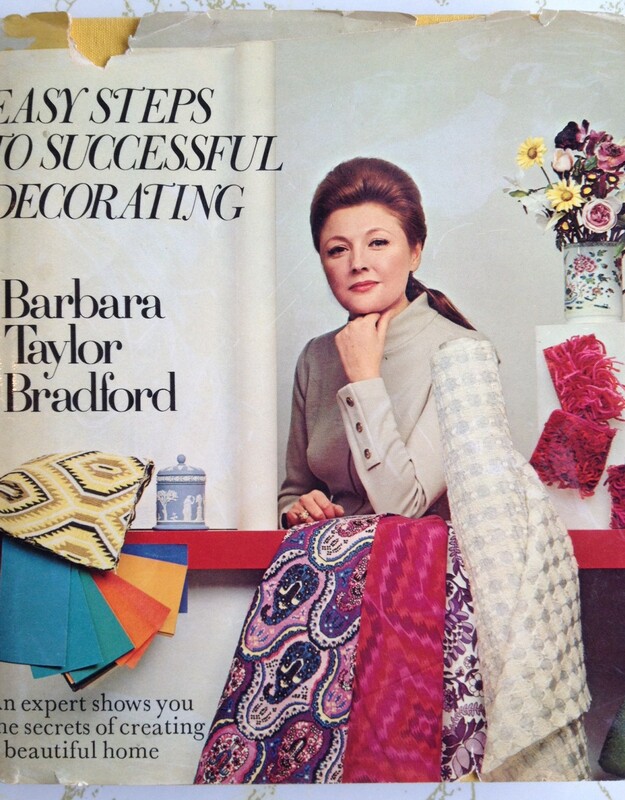 Nothing says “trust me to drape your room in fabric” like the old hand on chin pose. The book was published in 1971 and while that misses the clean looks of mid century modern, it does fit exactly into the swinging, psychedelic remnants of the late 1960s. There was just so much going on in design during this time. Nothing was too much and everything could be paisley. If you dream of living like Austin Powers I cannot express how much you need to own this book. It is full of practical advice on everything from choosing floor coverings, to wallpapers, to room plans that help you place your glass coffee tables and giant wicker chairs. There are numerous black and white, as well as full (and I mean FULL) colour photographs. Ms Bradford writes well (as you would expect from her success) and true to the book’s byline she explains all the details to achieve similar looks. Let’s take a gander at some of the photographs shall we? If you feel like tripping out at any point just look away from your monitor until you calm down. This is a bedroom. For sleeping. If you manage to even find your bed you will be in a position to stare up at the odd concentric rectangles. Sweet dreams! 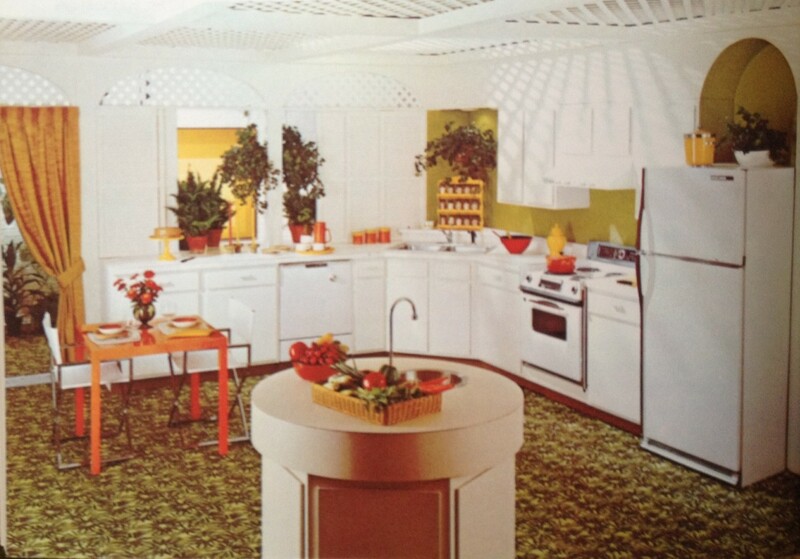 This is how I know people did drugs in the 60s – they put carpeting in the kitchen. Carpeting that looked like ferns. Grab a bowl of fruit from your tiny round island that features and even tinier round sink. Water your many plants. Can you possibly fit more lattice work into your ceiling? The sofa in this photograph is easy prey for stronger furniture. It must blend into its surroundings to survive. It distracts you from itself with zebra print pillows and short tables that are hard to reach from a seated position. I think this is a living room but it also has a dining room feel. Lots of seating options (none of them comfortable). I am actually quite enamored with that cheetah statue, and the combination of green, gold and brown reminds me of my Vernonware dishes. I get a Roman Emporer by way of Liberace vibe from this room and it is MAGNIFICENT. Everything in this room is crazy. There is no sane. Sanity cannot exist in the space that uses tenting as wall cover. Imagine if your child was hyperactive before they went into their room to play. This is described as a “teenage haven”. It is not an adult film set. 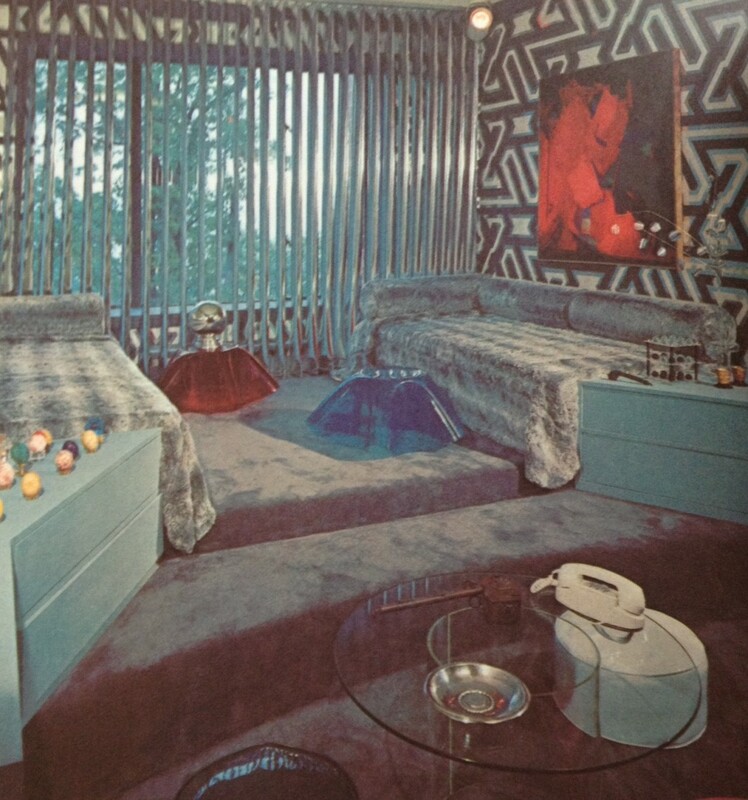 Do not be fooled by the sunken living room area or the fake chinchilla bed spreads. Is that an ash tray on the table? Yeah. Nothing inappropriate will happen here. So there is a lot more to this book but you get the idea. It’s choke full of the crazy, or the retro vintage goodness (depending on your tastes). 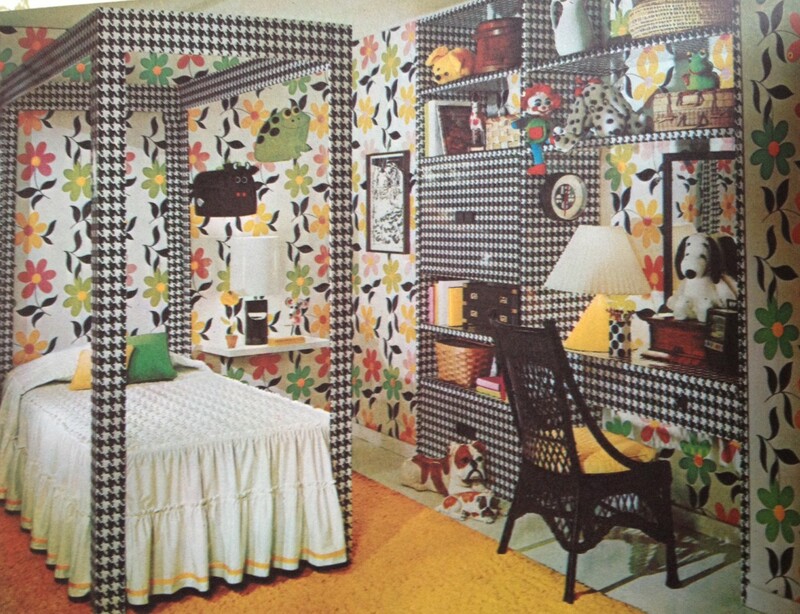 While I may not typically go for the geometric, eye confusing prints of 40 years ago, I will say that some of them beat the heck out of beige. And I will be keeping an eye out for one of those large plaster cheetahs. That cat would look so groovy in my living room. Holiday preparations are in full swing, and I’m off to sunny Orlando this week, so I’m going to make it quick and share a little something I found on TV. I was watching a rerun of the TV show “Rules of Engagement” (don’t judge me) and what should I see? Vintage Vernonware! A kitchen cupboard’s worth! It’s one of the plaids, and it looks like the pattern is probably “Organdie”. Organdie was designed by artist Gale Turnbull. It was the first plaid Vernonware and the other plaids (including my patterns Tam O’Shanter and Gingham) were inspired by this original design. The Organdie pattern was produced between 1937 and 1958. The funny thing, at least for a nerd like me, was that the plot of this episode revolved around a burglary. The apartment pictured above was broken into, but the thieves didn’t take anything because there was nothing “worth taking”. Ha ha. Joke’s on those imaginary burglars who didn’t realize that if they carefully boxed up that dinnerware and sold it on eBay, they could have made a cool 200 bucks. 300 on a good day. Sitcom burglars never want to put in the effort. Here’s another look at the Vernonware. They don’t have a lot, but the pieces they have are quite nice. 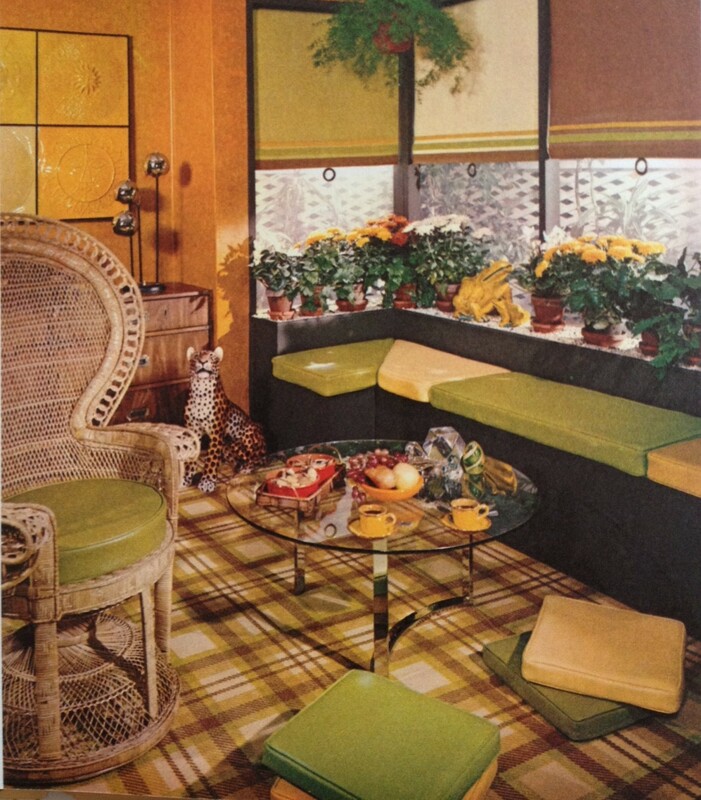 I especially admire the salad bowls (upper right) and tall tumblers (mid left). I’ve been trying to find those in my pattern and they’re rare. I’d like to think that at some point the set decorator who compiled these dishes will find my blog. If they do I just want to say hey, good job. Those are some nice dishes. (I’m pretty sure that this article will forever be the only google hit for “Vernonware Rules of Engagement”. I’m going to write niche niche blogs and make my millions!). Another small but lovely piece has joined my collection! Now if only I had some gravy. It is officially the holiday season! It’s a happy time of year but along with the parties, decorating, and general merriment you also have to sit down and think about gift choices. We all want to give those closest to us something that they will remember and appreciate long after the big day. What to get that is special, personal, and meaningful? 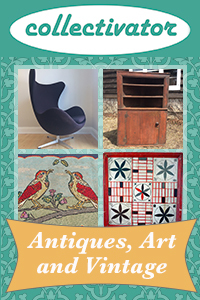 Think outside the mall and think antiques! 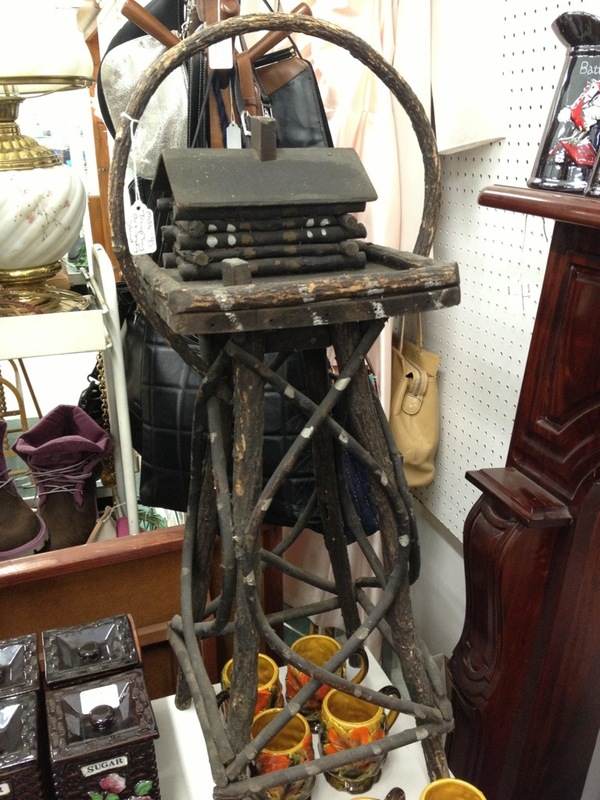 Antiques are unique and they make a big impression. They offer you a wide range of gifts that can really connect to a person’s interests, history and lifestyle. I’ve been clicking around Collectivator, and I’ve come up with some ideas based on items for sale right now. I’ve tried to match the antiques with interests, but I am not implying rigid rules. My aim is not to say “only a crafter would like a hooked rug” but to show how different interests can be cultivated and complimented by antiques. If you wish to learn more, each photograph is linked to that item’s listing on Collectivator. The Outdoorsman or Woman – Try incorporating function and history with an item like an antique decoy. Decoys may have been used by hunters but they also have artistic merit. Other good gifts would be antique snowshoes (nice displayed on a wall), landscape artwork, or any twig furniture. Anglers will find a wealth of items as well including beautiful antique wicker creels, reels, and even lures. Don’t forget that there is a lot of folk art, fine art and advertising that is also dedicated to nature and sportsmanship. All these items bring a bit of the outdoors inside in a unique and unexpected way. Crafters might likewise enjoy an antique that reflects the history of their interests. In the past, activities like sewing and quilting gave people an outlet for their creative expression. Their work was necessary but it was also a source of pride and joy. Antique textiles come in a variety of prices and pedigrees, but all share a history that modern day crafters would appreciate. Good gifts include hooked rugs (lovely either used on the floor or hung on a wall as a piece of art), quilts, linens and needlework samplers. I also found a great folk art sewing plaque that served to hold thread and other sewing supplies. It would look fantastic on the wall of a craft room. Entertainers – No, I don’t mean they put on shows (although that would be fun), I mean people who host gatherings with friends and family at their homes. For a person in this category, anything that is decorative but also useful would be appropriate. Decanter and glass sets are gorgeous sitting on display or filled with fine drinks. Dining accessories like antique table cloths, dishes, candle sticks and silver serving ware compliment any great meal. Even not so useful items like hand made wooden butter molds would look good in a chef’s kitchen and serve as a conversation piece about culinary history. Who knows? You might introduce your favourite party host to a new collection! Anyone – There are some antiques you can give to pretty much anyone. 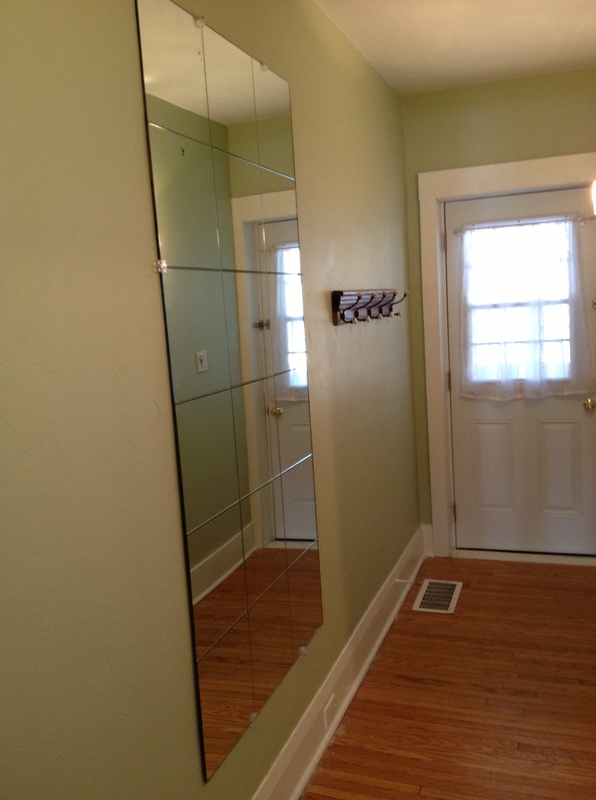 Clocks and mirrors are good, because they are always needed and can compliment so many styles of decor. Small furniture like wall boxes, side tables, plant stands and decorative shelves can easily find a welcoming home. Artwork can be tricky (especially large pieces) but work that ties into some aspect of the person’s interests or background can be exceptional. 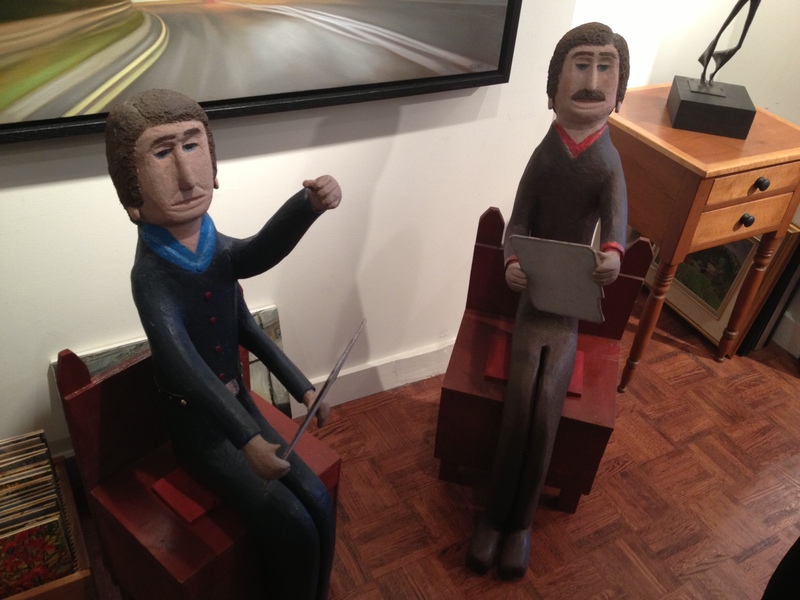 Personally, I would love to receive a good piece of Canadian folk art on any occasion! Happy shopping and enjoy the holiday season! Isn’t she a beaut? Skinny legs and all. Jardinieres are large decorative planters (the word comes from the French jardiniére which is the feminine form of “gardener”). McCoy made different jardinieres over the years and many came on pottery or metal stands. Finding a jardiniere with matching pedestal is quite the feat for collectors, so I’m lucky to have found one with both “jard and ped”. The “Spring Wood” design was first produced in 1961. 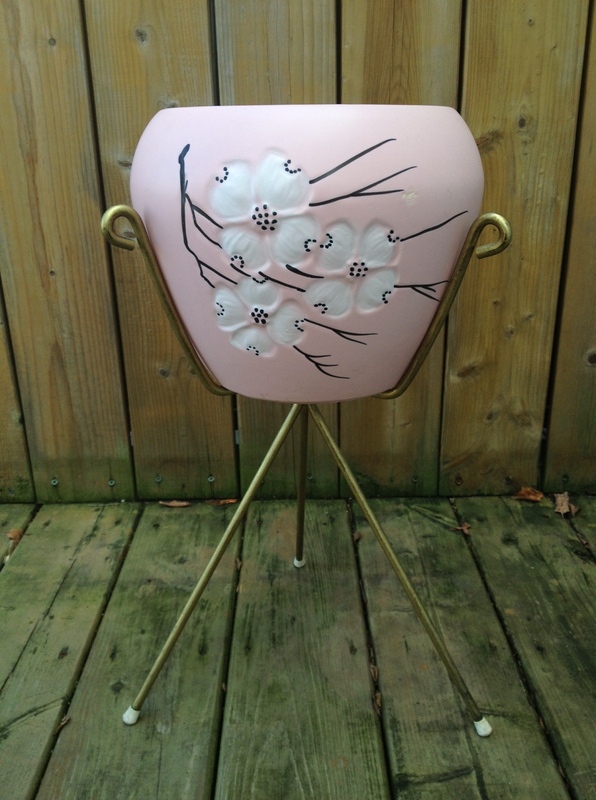 It was made in pink, white and mint green with hand painted dogwood flower motif and a satin glaze. The design proved popular and was also used on smaller planters and vases. I love this set’s vintage look. The legs in particular, with their slightly “space age” satellite configuration, are classic mid-century modern. My Jardiniere is in great condition with only one small mark. There is a slight indentation from when the pottery was made on the upper right corner of the design. It’s a minor flaw and otherwise the pot is without cracks, chips or crazing. The pot measures around 9″ wide and 7″ tall. She’s a good solid planter used every day to house my money tree. 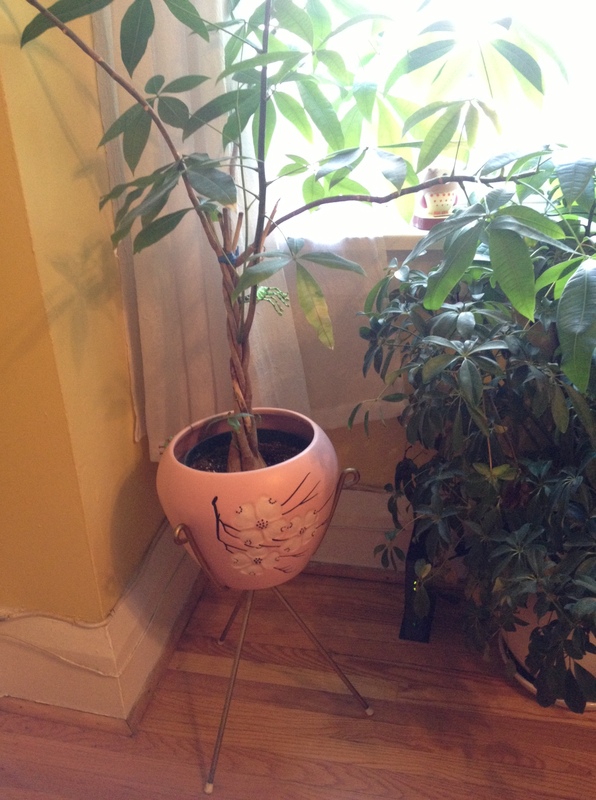 Amazingly, the money tree is still alive! 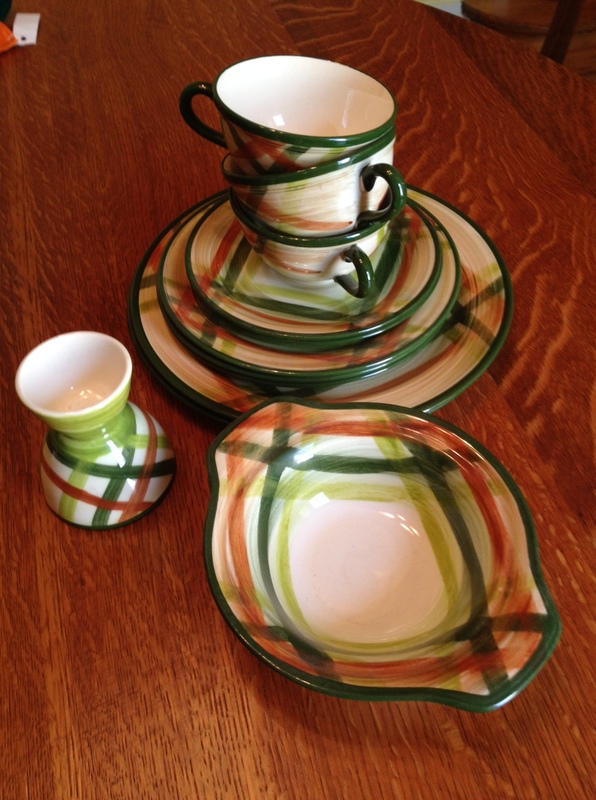 I bought this set in an antique store in Quebec City about 10 years ago. When I bought it my boyfriend and I didn’t have a lot of extra money, so I know I would not have paid a huge amount (maybe $80?) I can’t remember, but I know the price was on the line between “that’s a lot of money for something I don’t need” and “if I don’t get this now I will always regret it”. I think every collector faces this dilemma from time to time! To sweeten my deal, the price also included a smaller rectangular planter from the same line. How could I resist? Thinking of collecting McCoy? 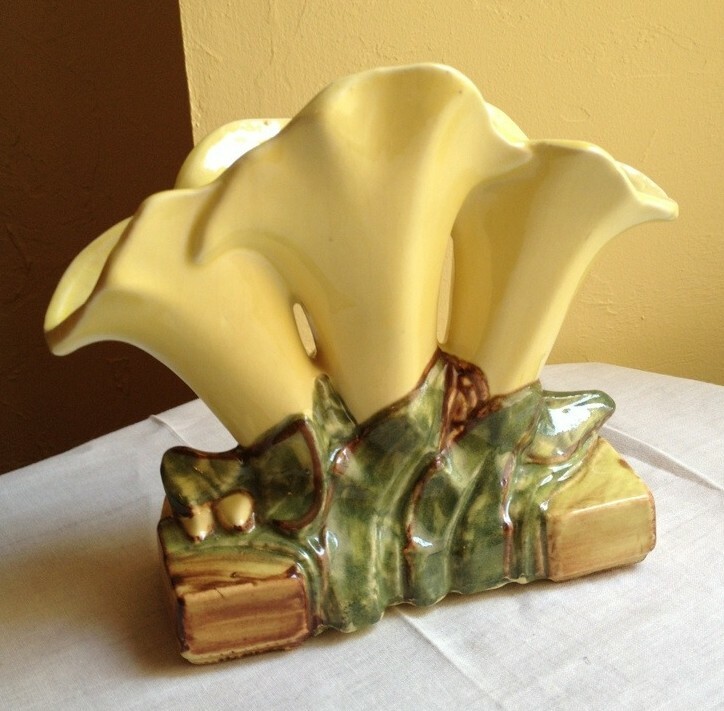 Check out the McCoy Pottery Collectors Society for great info including production dates and photographs of popular lines. Last weekend I had the pleasure to attend the book launch of Canadian Folk Art to 1950 and accompanying folk art exhibit at the Ingram Gallery in downtown Toronto. The gallery was a lovely space (they also exhibit an impressive selection of contemporary Canadian art) and the staff were very welcoming. 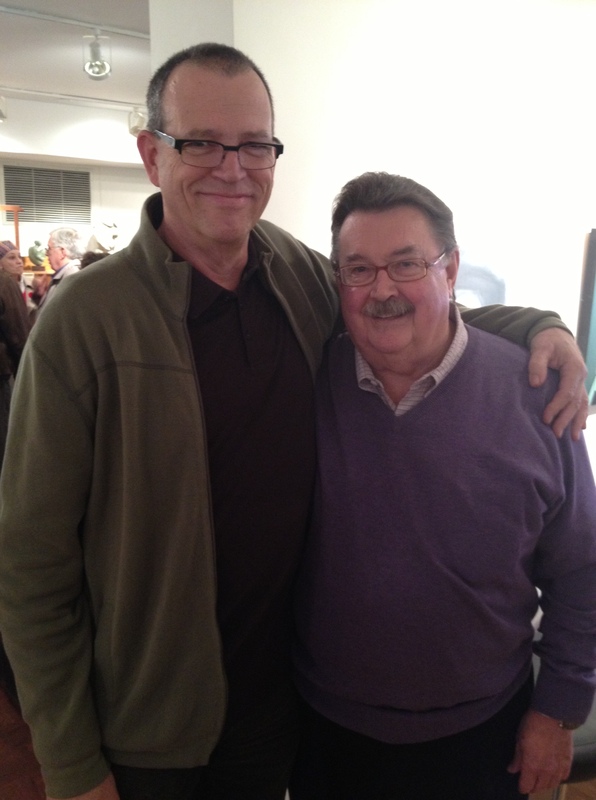 It was a great chance to catch up a bit with Collectivator sellers, old family friends, and folk art enthusiasts alike. There was a small but inspiring selection of high quality Canadian folk art on exhibit and for sale, including substantial works from Ewald Rentz, Joe Norris, Leo Fournier and Gilbert Desrochers. Some of the pieces were sold by the time we left (and we only stayed an hour!) but the show will continue until the end of December 2012. If you are a collector in Toronto you will want to check it out. 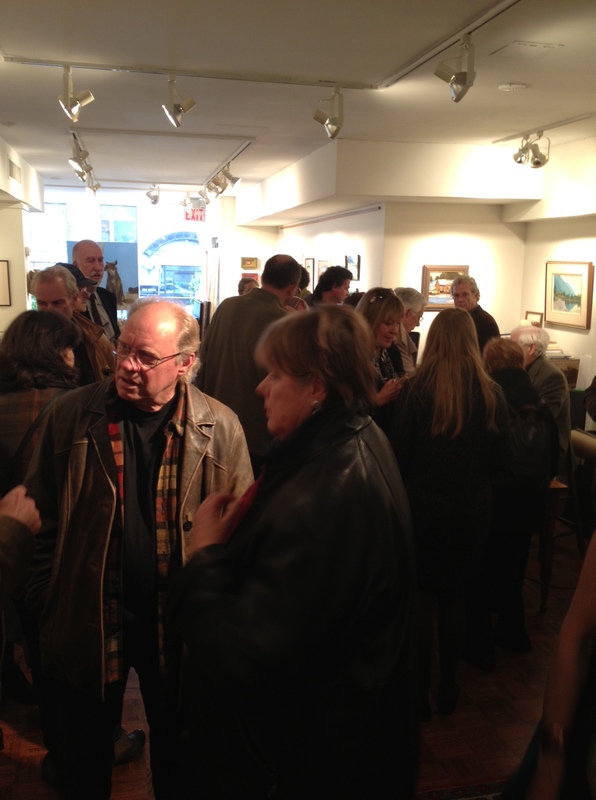 While the folk art was great to see, it was also a fitting backdrop for a launch of the book Canadian Folk Art to 1950. 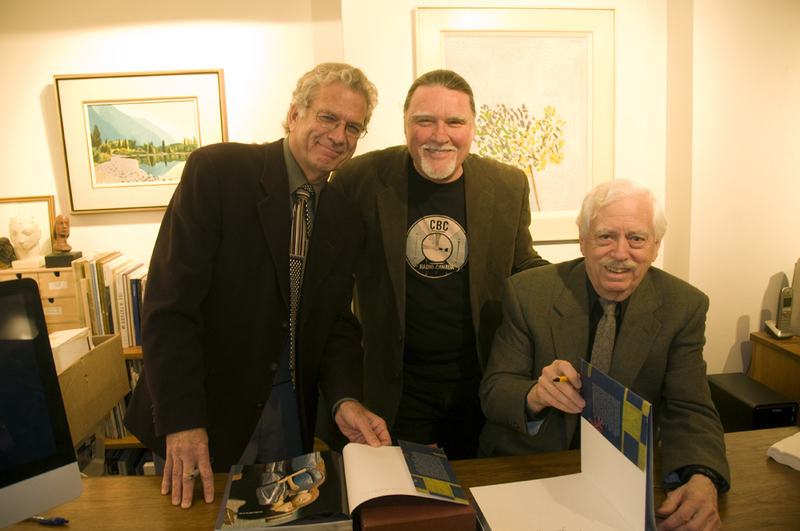 It was a pleasure to meet the authors John Fleming and Michael Rowan, as well as photographer James Chambers. I haven’t had a chance to read the book cover to cover yet, but I am impressed by the scope of work featured. Everything from purely decorative folk art like paintings and carvings are covered, as well as utilitarian pieces like hooked rugs, plant stands, trade signs and pharmacies. There are just under 500 large beautifully photographed images with careful examination of each piece. The book is organized into seventeen sections that focus on a particular type of folk art and its importance to the folk art tradition, as well as the cultural history of Canada. When I spoke to photographer James Chambers he said it took over five years to put the book together and I can believe it. From what I have read so far, I think this is a book many Canadian history and folk art enthusiasts would enjoy. It also serves as a useful introduction to folk art for those just starting to appreciate this wonderful artistic tradition. 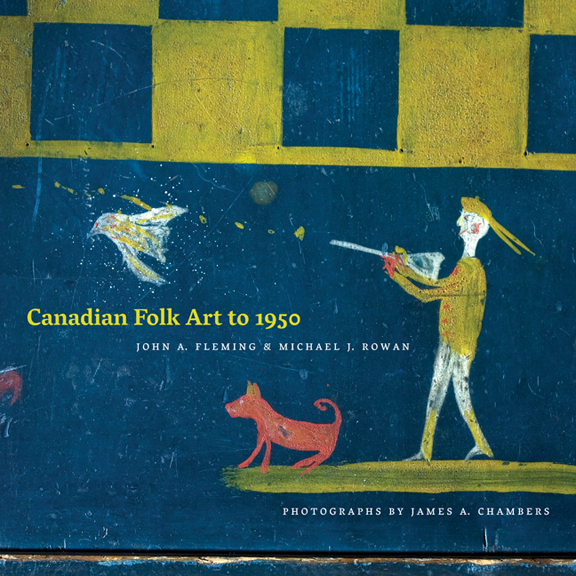 There is more information about Canadian Folk art to 1950 in this PDF (canadian_folk_art), as well as on the Ingram Gallery website. You can buy the book from the Ingram Gallery, through the publishers at the University of Alberta press, or in bookstores. 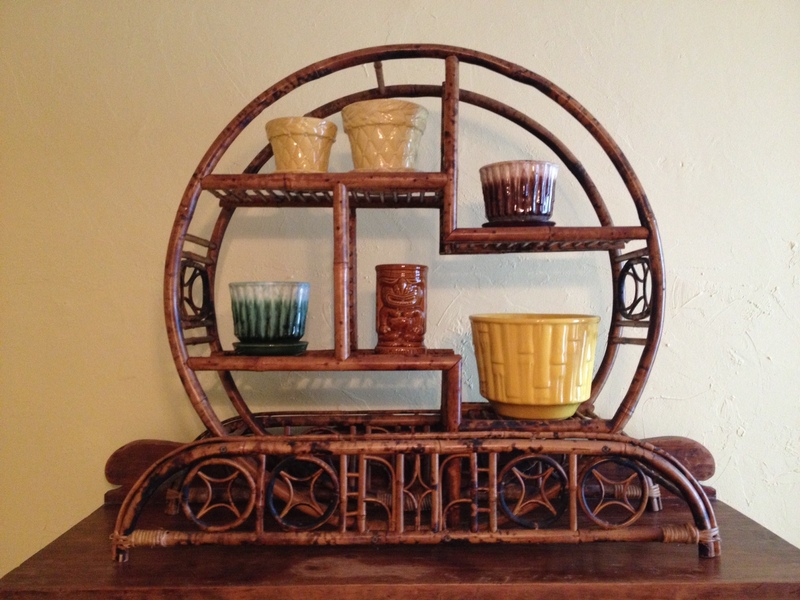 The holidays are coming and this would make a great gift for the folk art fan on your list! 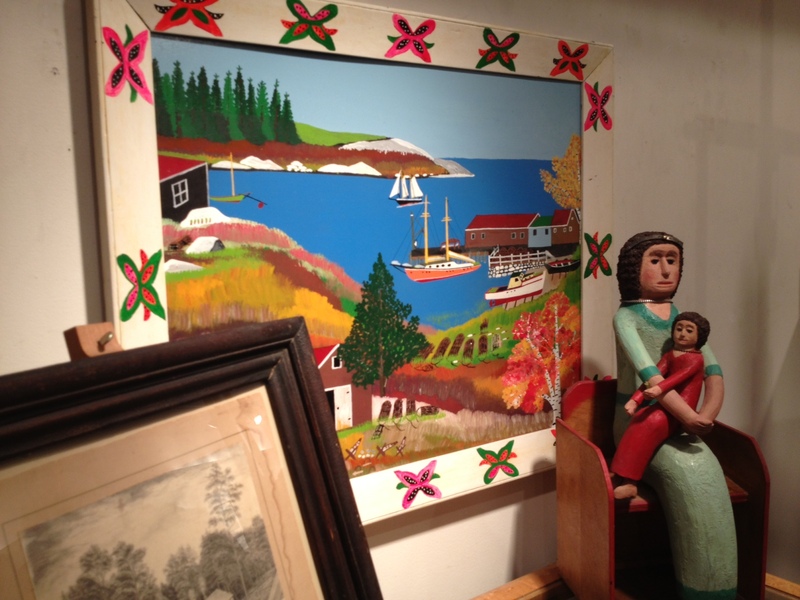 It is truly a major contribution to the Canadian folk art legacy. I know I am very happy to have a copy and will enjoy it for years to come.